Since I have not updated my blog in well over 2 years, and I just can’t seem to get the desire back to do so, it will probably just die when my subscription to GoDaddy runs out. In a way, that’s pretty darn sad, since I have been to 21 countries since we went to France in 2014. I’ve taken thousands of photos on these trips, too. 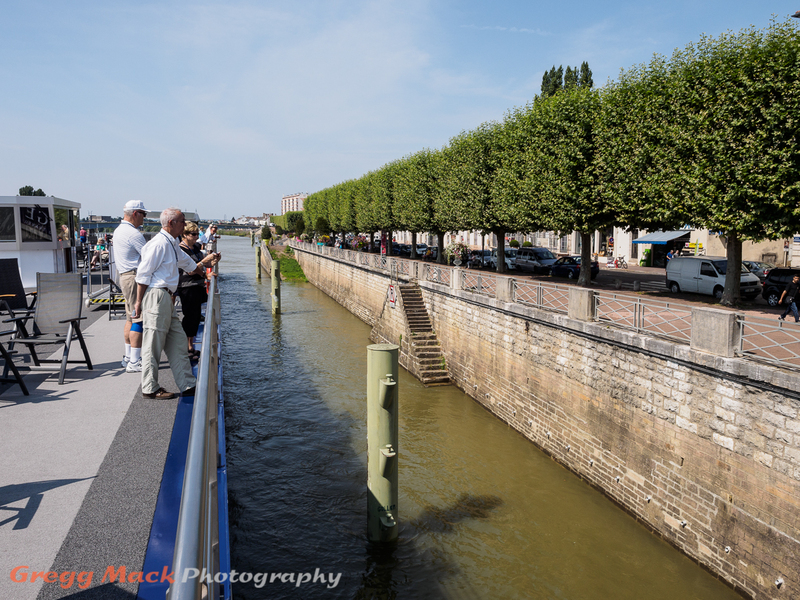 In my previous 4 posts, I have shown 71 photos from the first 9 ½ days on the French Waterways vacation that we went on last July. 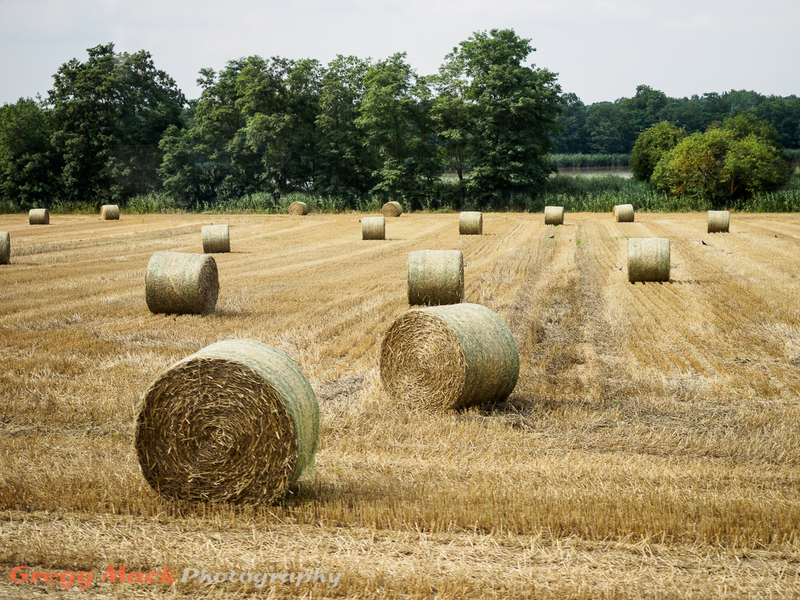 This post will show 20 more photos that were taken over the next 3 ½ days. 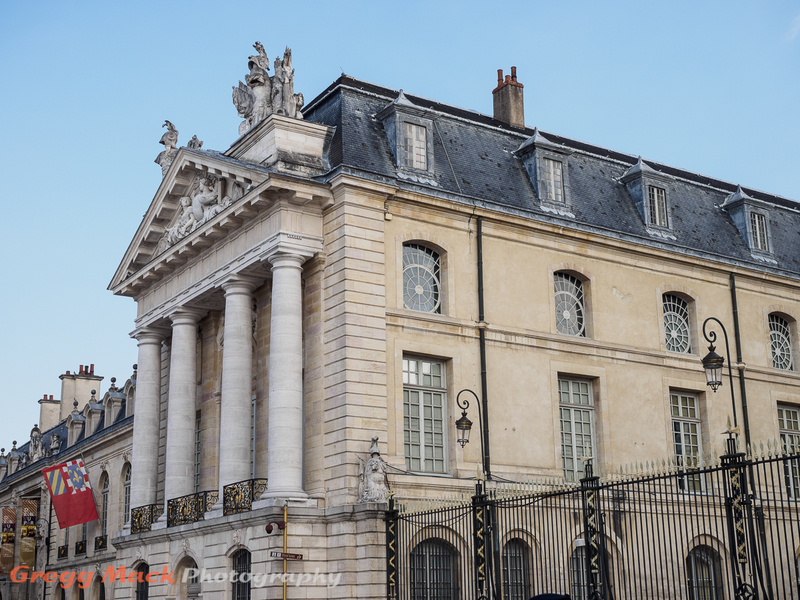 All of these photos were taken within the city of Paris. 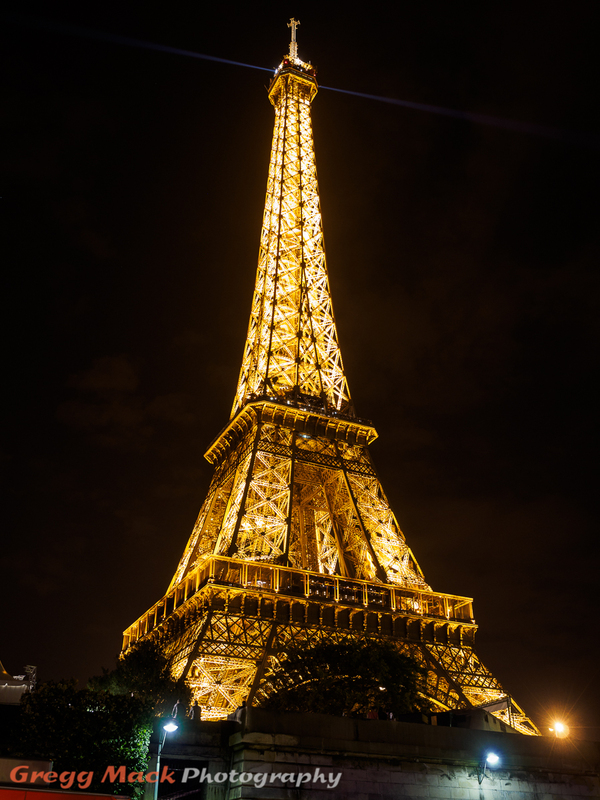 We arrived in Paris aboard the high speed train; the Train à Grande Vitesse (TGV). 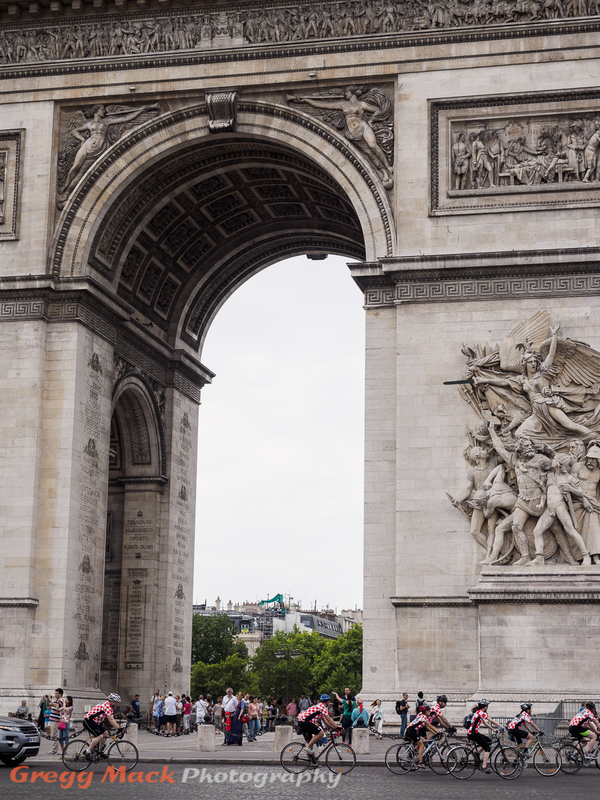 It was Saturday, July 26th, which was the day before the Tour de France bicycle ride would end near the Arc de Triomphe on the Champs-Élysées. The opening photo was taken at that location The bicycle riders in my photo are not the racers, but are some of the bicycling enthusiasts that pay for the privilege of riding the entire distance of 3,664 km (2276 miles) of the course – one day ahead of the real racers. Reminder: You can always view any photo at a larger size by just clicking on it. You will then need to use your browser’s “Back Button” to return to my story. Barb and I walked from our hotel the 10 blocks or so to the Arc de Triomphe (with 2 other ladies who had signed up for the 3 day extension in Paris). 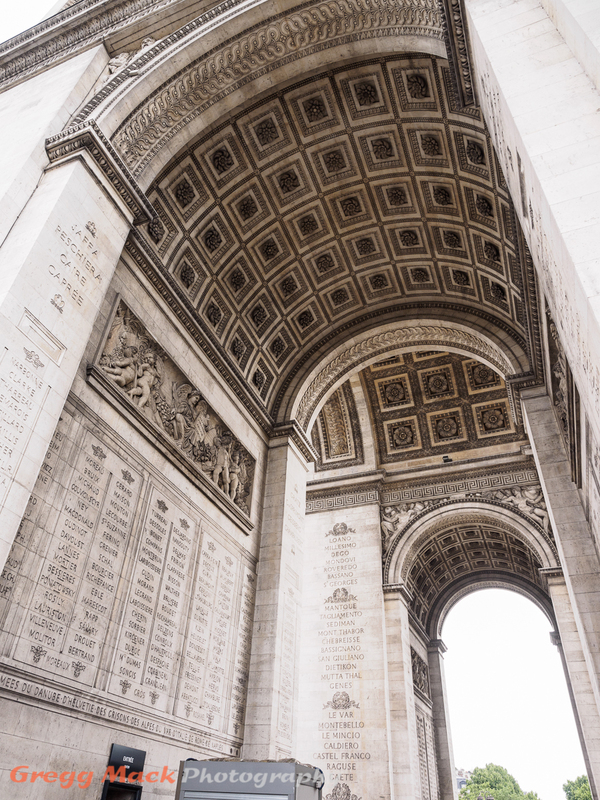 This monument was completed in 1836, and its size is truly astonishing! 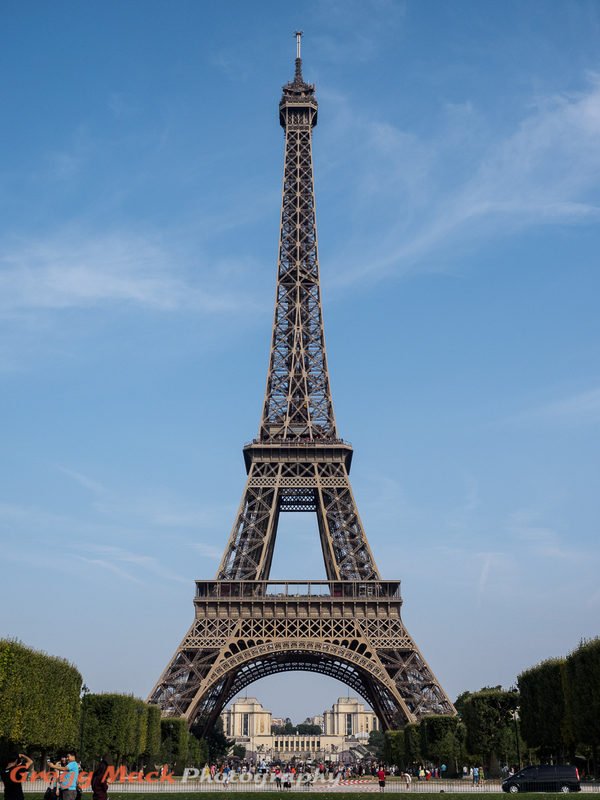 It stands 164 feet high (50m), and the large vault is 95.8 feet high (29m). After dinner that same evening, others in our Vantage Travel group thought it would be fun to strike out on our own to see if we could get to the Eiffel Tower and go on a river boat ride in the “City of Light”. That would involve using a subway system in a land where we didn’t know the language very well…. As we waited to board the boat, I managed to get a couple of photos during twilight. 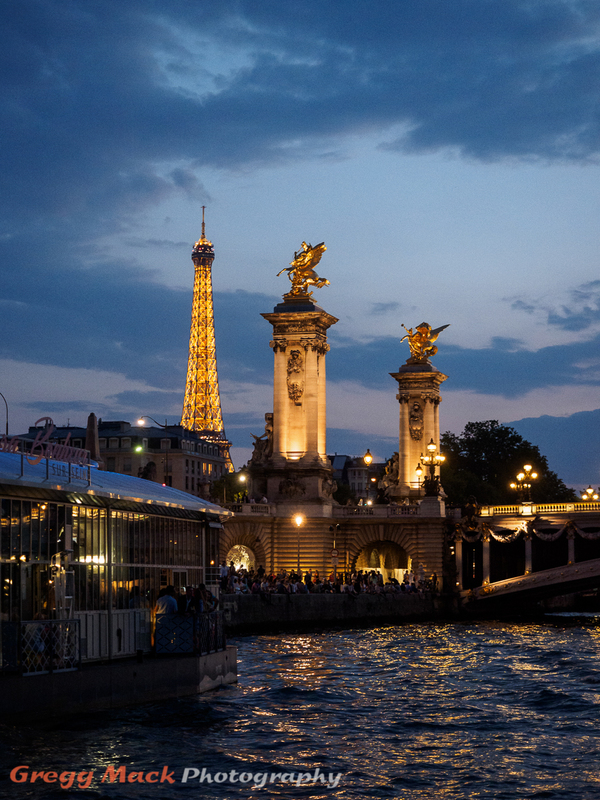 Darkness quickly came upon us as we started up the Seine River. 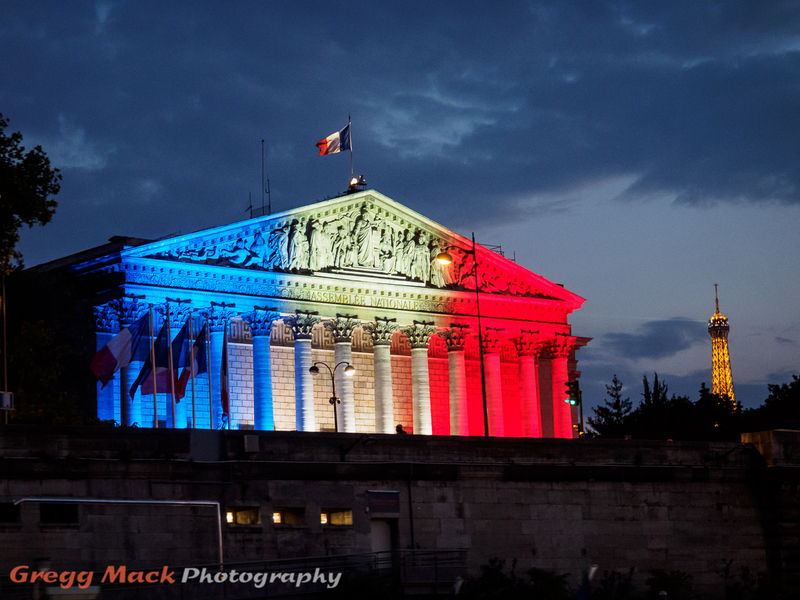 The Palais Bourbon is where the French National Assembly sits, and is illuminated at night to look like the French Tricolor (flag of France). I carried my tripod that evening. After the boat ride, I put it to good use. It was late – very late – when we finally made our way back through the subway system to our hotel that night. 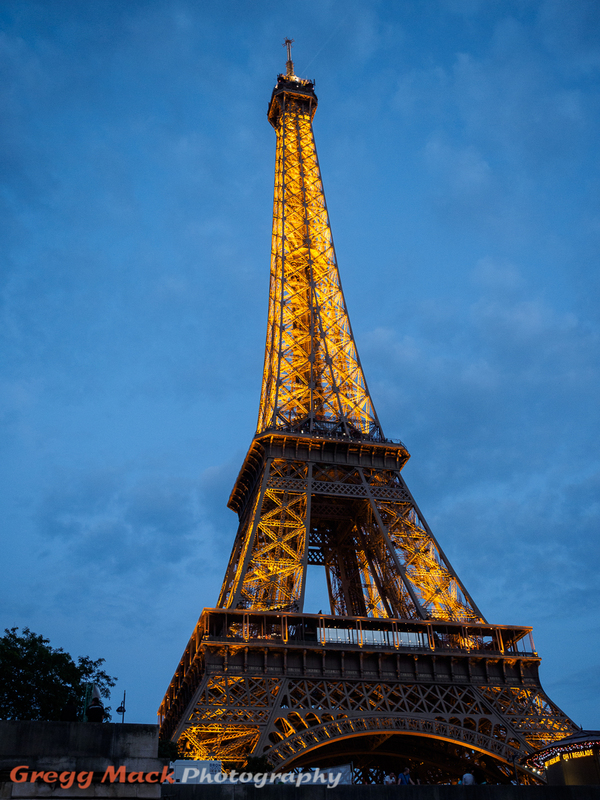 We were up early the next morning, and on the bus for a City Tour of Paris. 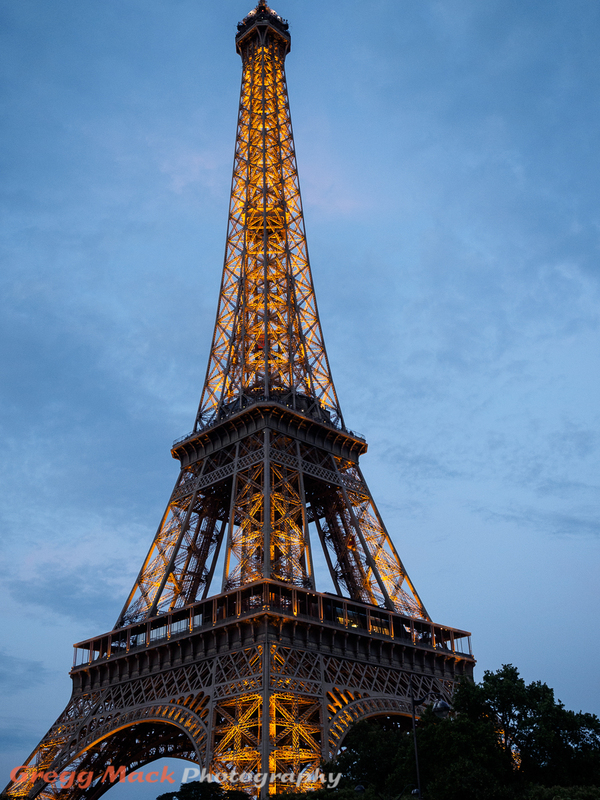 The Eiffel Tower in the morning. 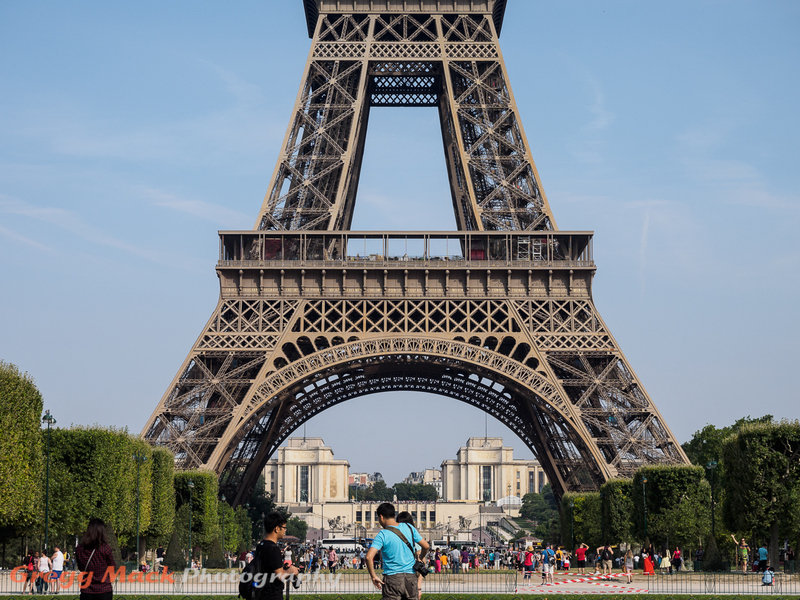 We were let off the bus on the Champ de Mars for about 15 minutes to get some great photos of the Eiffel Tower. 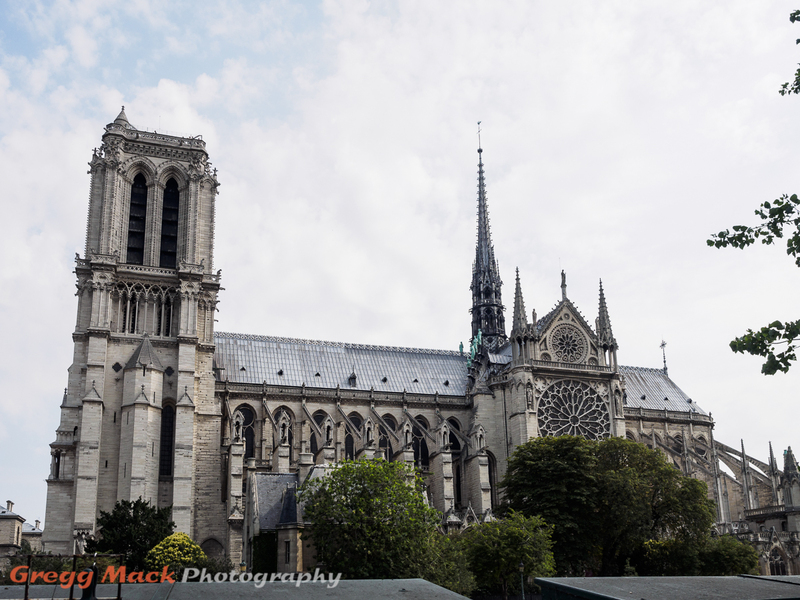 About an hour later we were walking toward the Notre-Dame de Paris, and this was our view of it from across the Seine River (we were on the south shore). 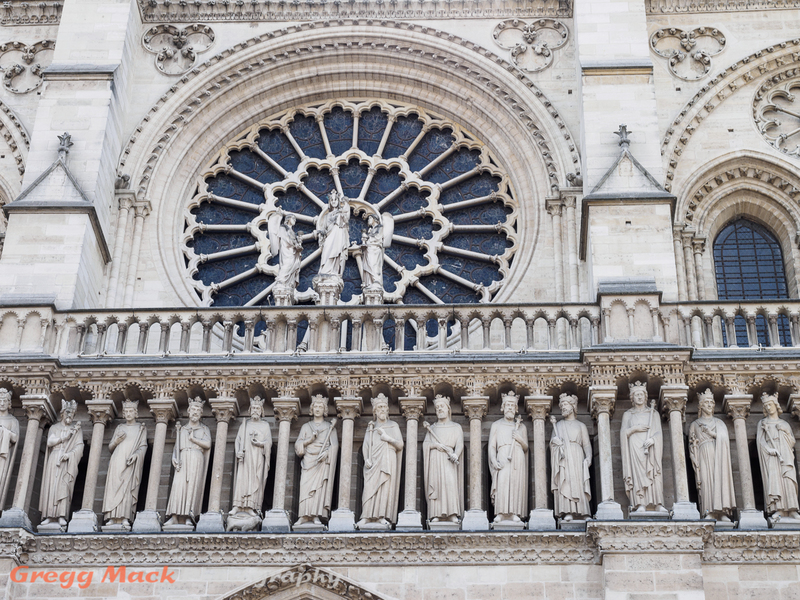 Note the flying buttresses and those two large round stained glass windows. 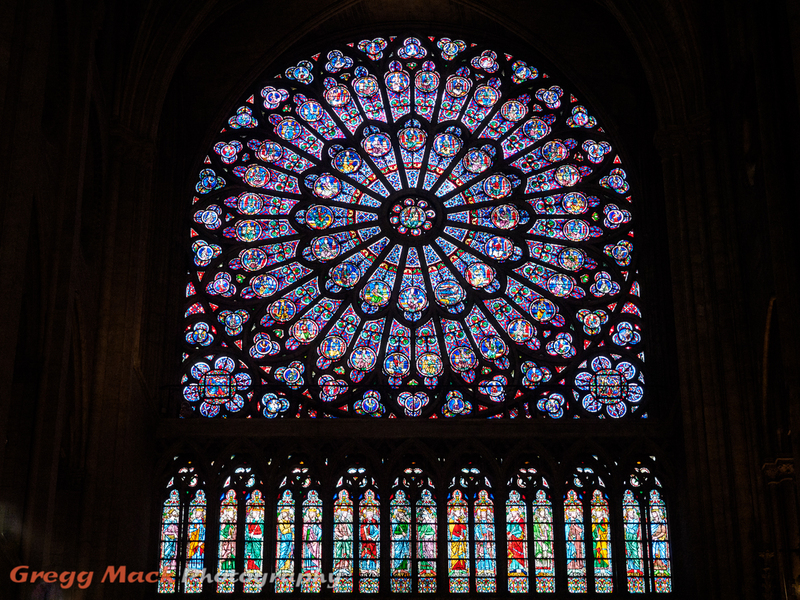 The bottom one is the south “rose window”. We crossed the bridge over the Seine, and waited to enter the church from the west (left side in the photo above). This is some of the elaborate stone work above the entrance on the west side. And here is a view of that south “rose window” that you saw earlier from the outside. Afterwards, as we waited outside, I took this photo of the archway above one of the two main entrances on the west side of the church. 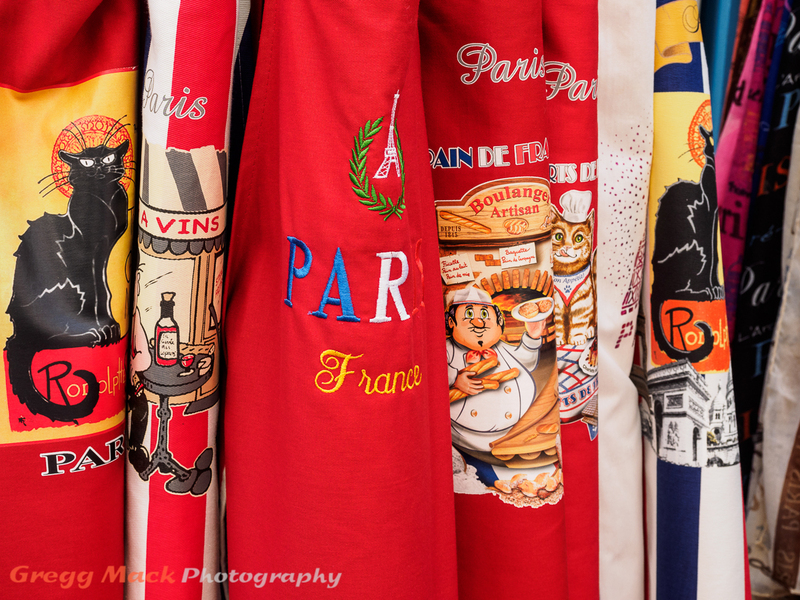 About 3 hours later, we were walking around in the Montmartre area when I found this colorful display of cooking aprons that were for sale. 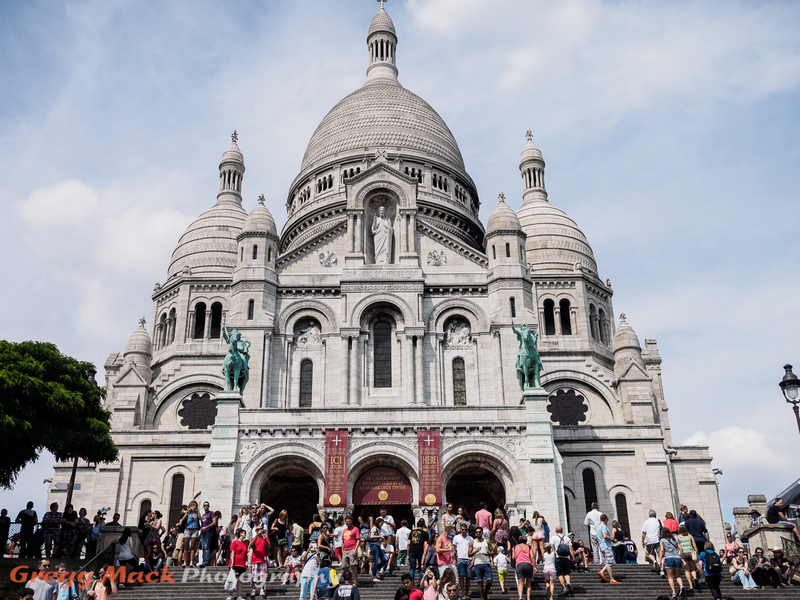 Walking and eating in the Montmartre area. Montmartre is a hill in the north of Paris, primarily known for the white-domed Sacré-Cœur Basilica (Basilica of the Sacred Heart of Paris) on its summit and as a nightclub district. 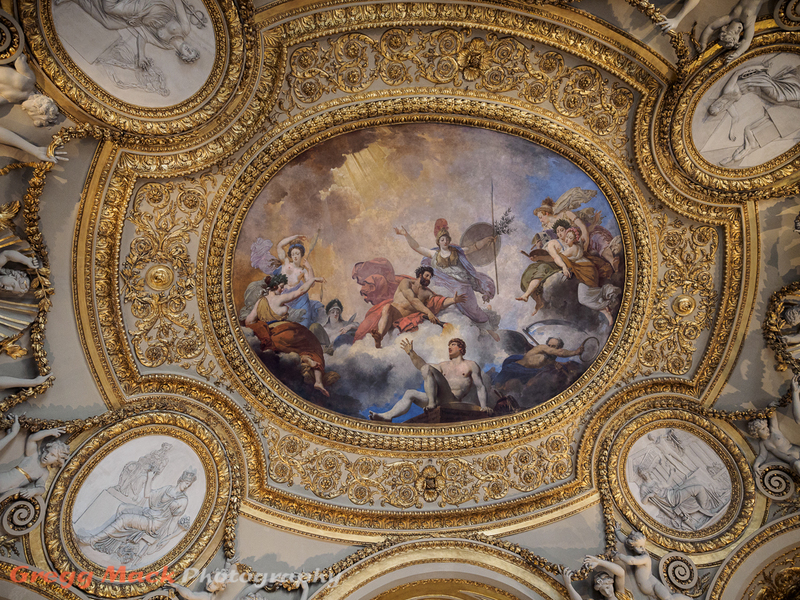 The next day, we joined about 20,000 of our fellow man and went on a tour of the Musée du Louvre (Louvre Museum). There were so many people in that building, that the only photos that you could get without people in them were photos of the ceiling. 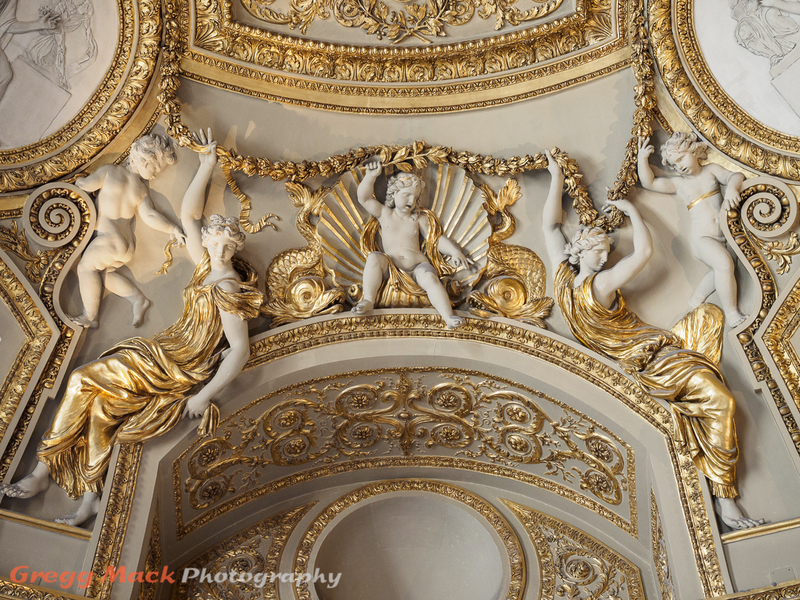 Fortunately, it was a beautiful ceiling! 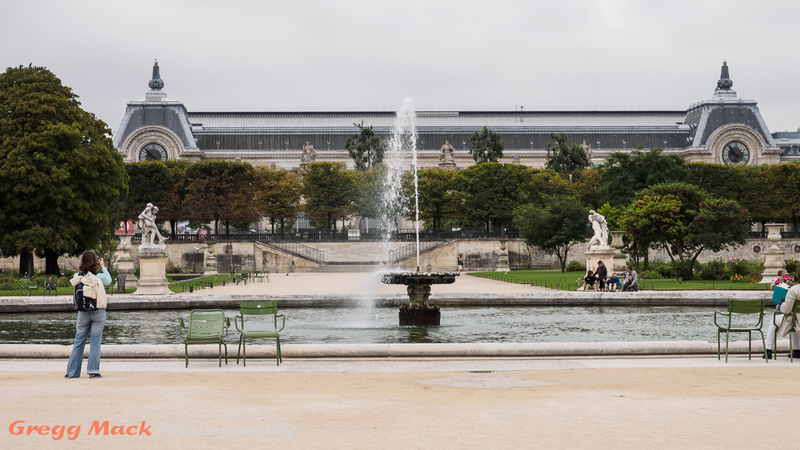 On our last day of our 3 day stay in Paris, Barb and I went all by ourselves from our hotel, using the Paris Metro (subway), walking across the Tuileries Garden and over the Seine River to the Musée d’Orsay (Museum of Orsay). This art museum was originally a railway station. We saw some incredible works of art at that museum, but unfortunately photography of the artwork was strictly prohibited. 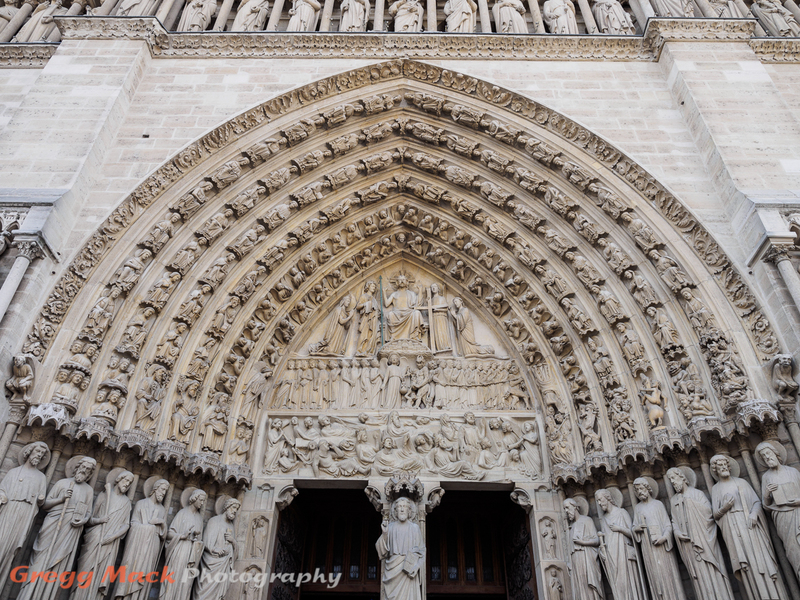 OK, so now I’ve shared with you 91 of my favorite photos that I took while in France this past July. Although I showed them in chronological order, there are too many gaps between some of them to tell the full story. In my next blog post I intend to “fix that” for those who are interested in seeing a more complete story of this fabulous trip. Goat cheese factory in Chissey-lès-Mâcon, in the Burgundy region. 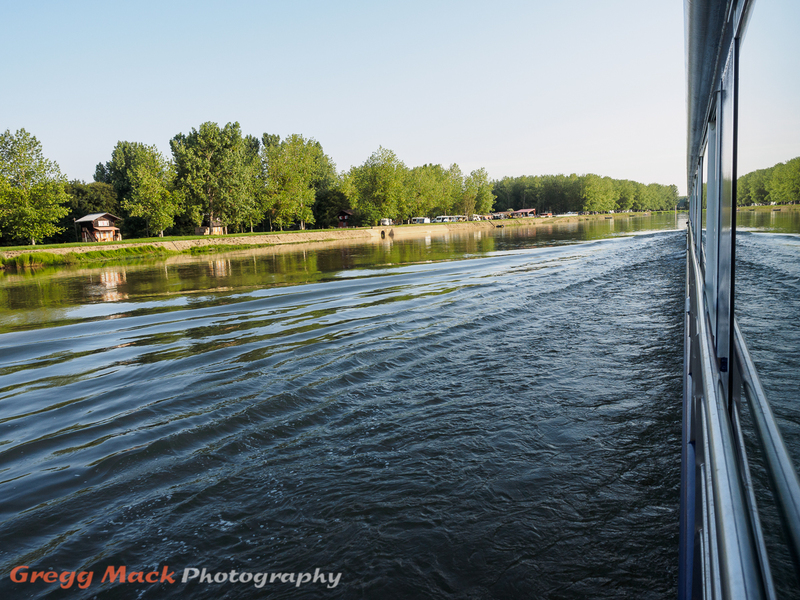 In my previous 3 posts, I have shown 48 photos from the first 7 days on the French Waterways vacation that we went on last July. 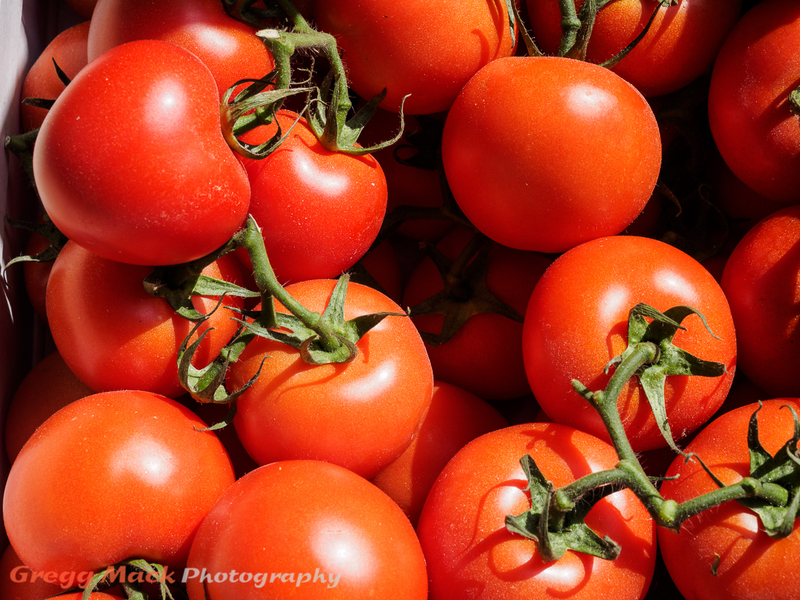 This post will show 23 more photos that were taken over the next 2 ½ days. 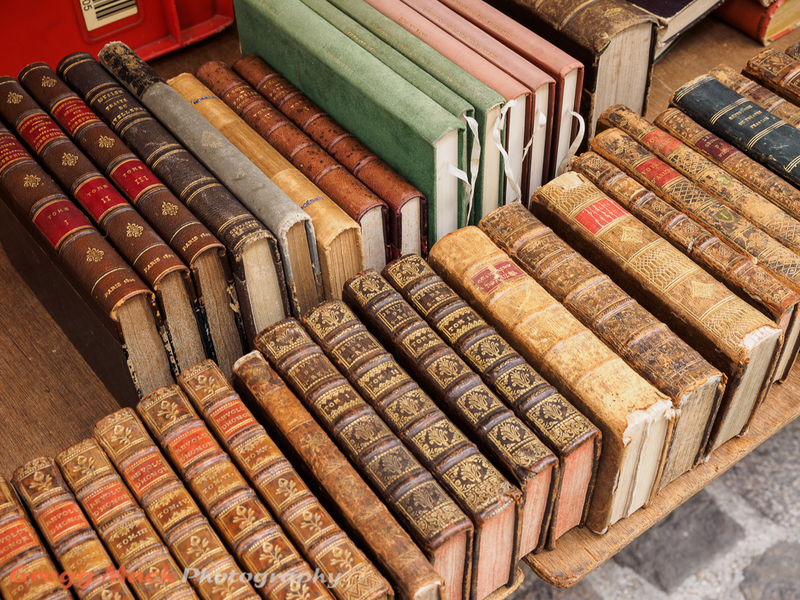 Because of the large number of photos in this post, I will keep my comments to a minimum. 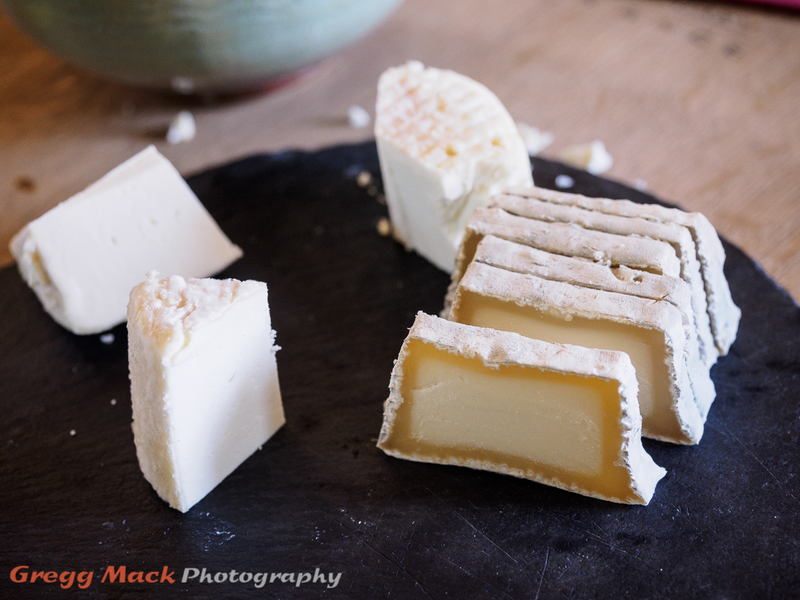 The opening photo was taken at a goat cheese factory in Chissey-lès-Mâcon, in the Burgundy wine region in eastern France. This was the first day in nearly a week that we were blessed with a clear, blue sky, and everyone’s spirits seemed to lift because of that. 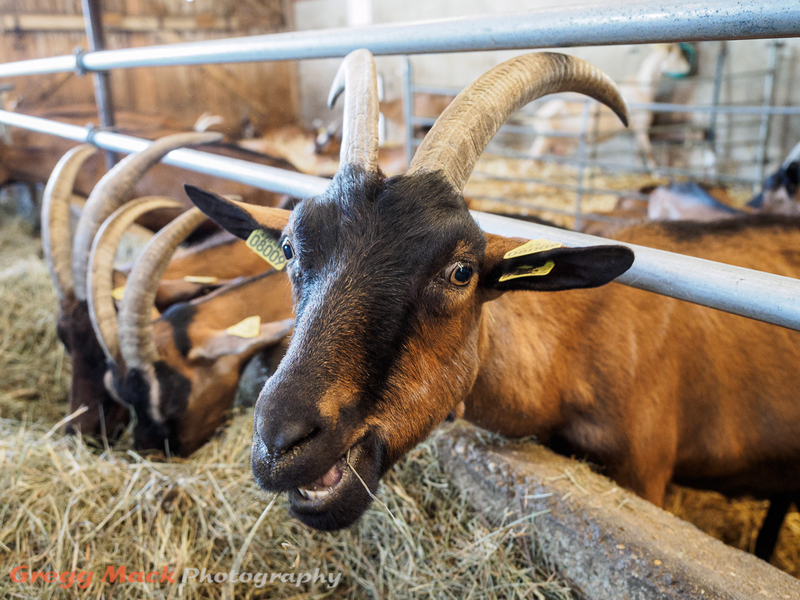 The goats were very friendly, they loved being petted, and goat cheese was delicious! 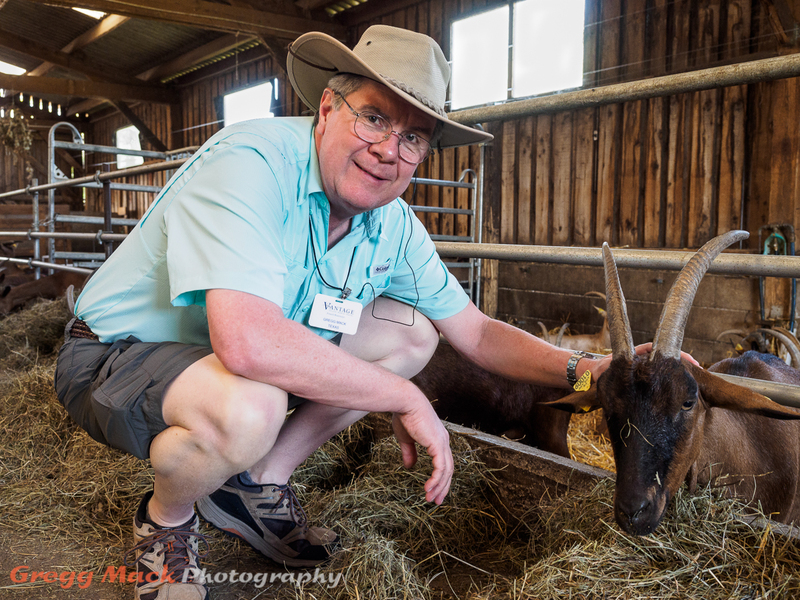 After we left the goat farm, we stopped for a short while in the very small village of Chapaize. 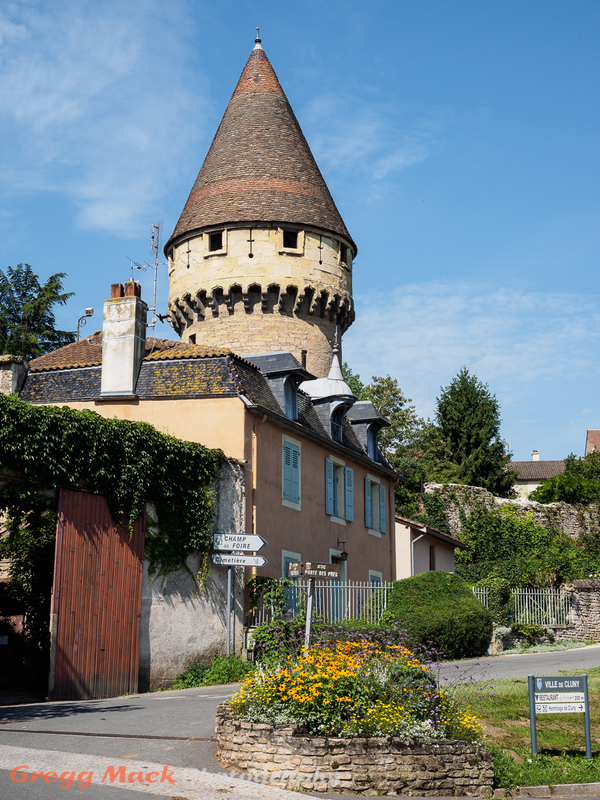 Chapaize, in the Burgundy region. The blue sky was very welcome to us! After Chapaize, we headed to Cluny. Cluny, in the Burgundy region. 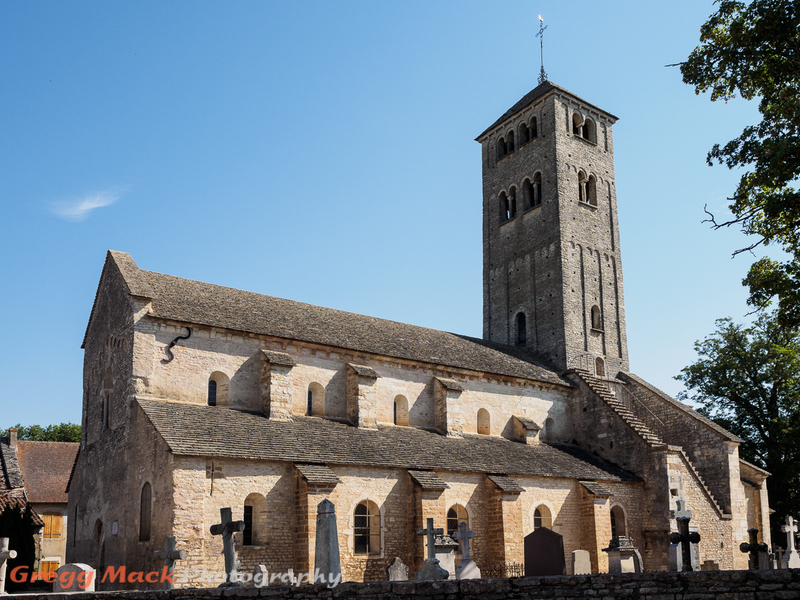 We spent several hours in Cluny, and we started off by going on a fascinating tour of the remains of the Cluny Abbey. 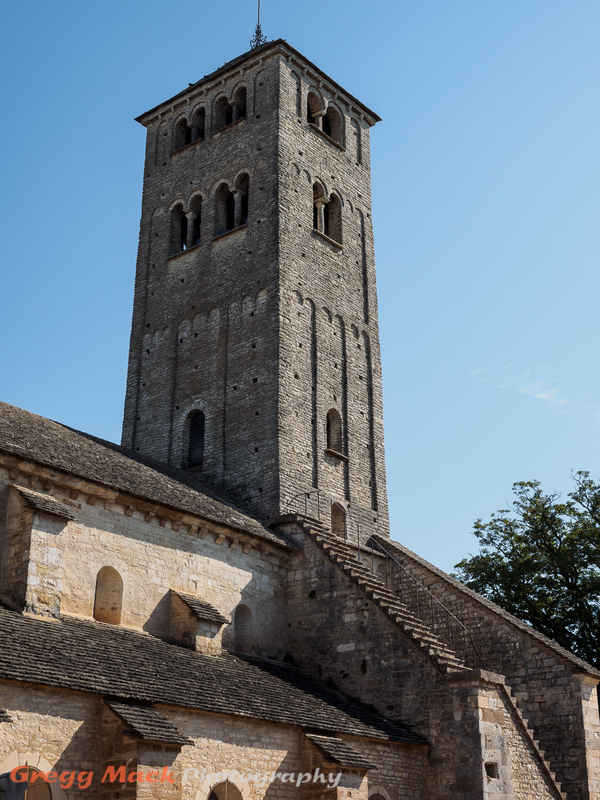 The Cluny Abbey was built in the Romanesque style of architecture, with three churches built in succession from the 10th (910 AD) to the early 12th centuries. In 1790 during the French Revolution the abbey was sacked and mostly destroyed, with only a small part of the Abbey surviving till today. 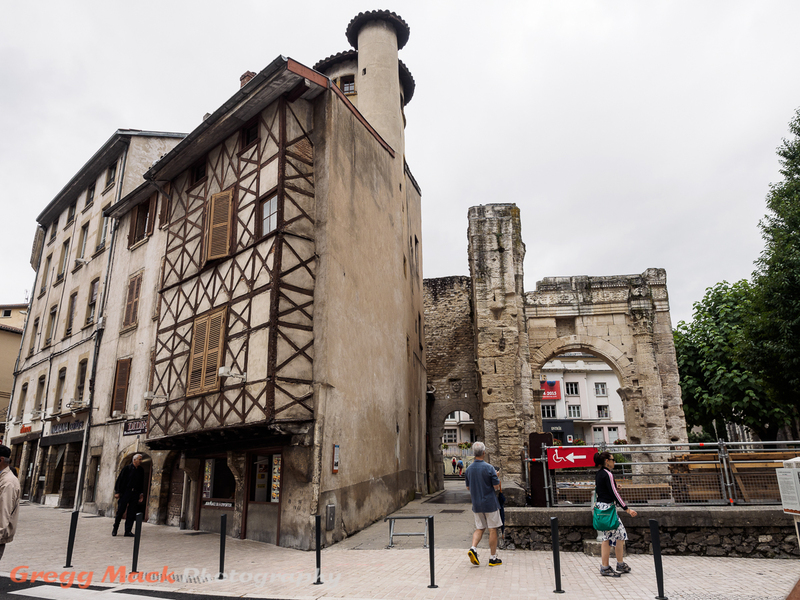 We then had about an hour to stroll around the small, but very busy town of Cluny. Barb bought a very nice casual dress, and I entertained myself with all sorts of photographic opportunities. After a 30 minute bus ride through the beautiful Burgundy region, we stopped for lunch at a wonderful event facility in Chérizet. That evening after dinner, several of our travel group went up to the top deck of the boat while we were docked in Mâcon. This was the 2nd time that I used my travel tripod on this trip. 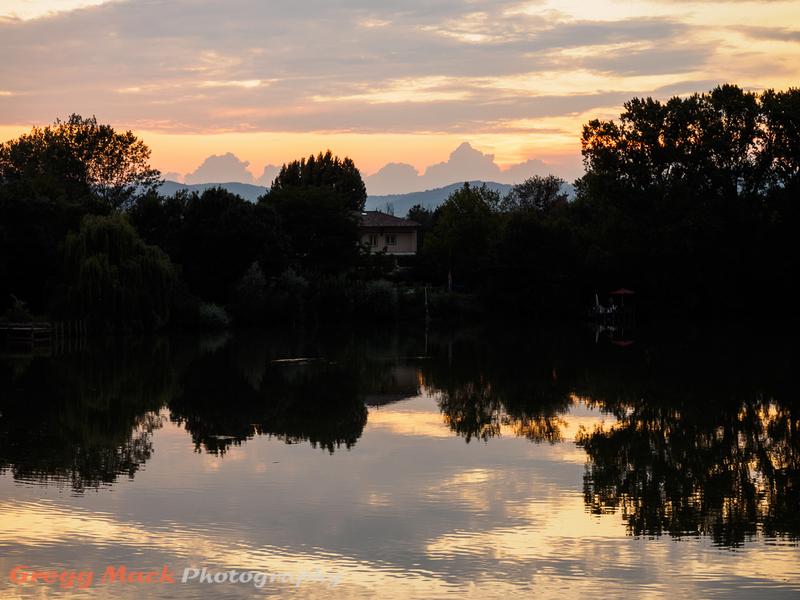 The next morning, I poked my head out of the open window to our cabin on the boat, and took this photo while we cruised north up the Saône River. Early morning cruising, north of Mâcon in the Burgundy region. We docked our boat shortly before noon in the town of Chalon-sur-Saône. 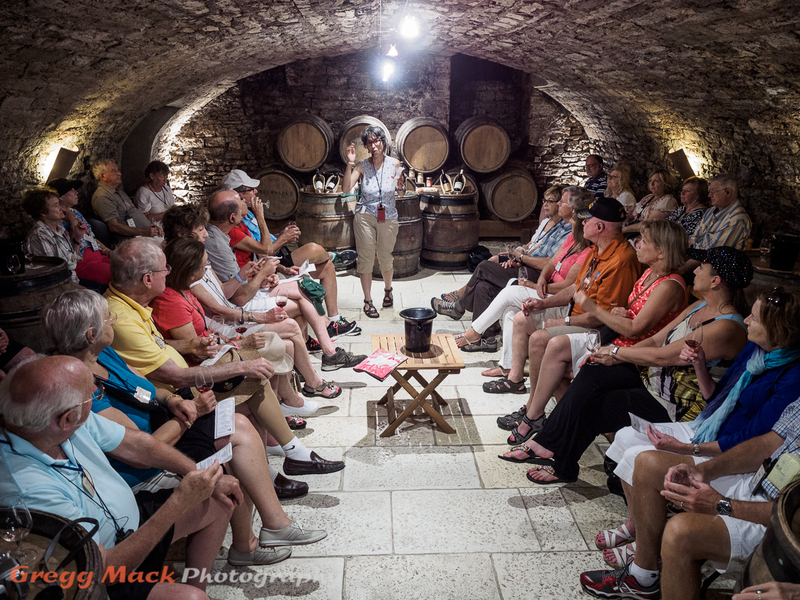 That afternoon we visited a wine cellar in Beaune. Visiting a wine cellar in Beaune. 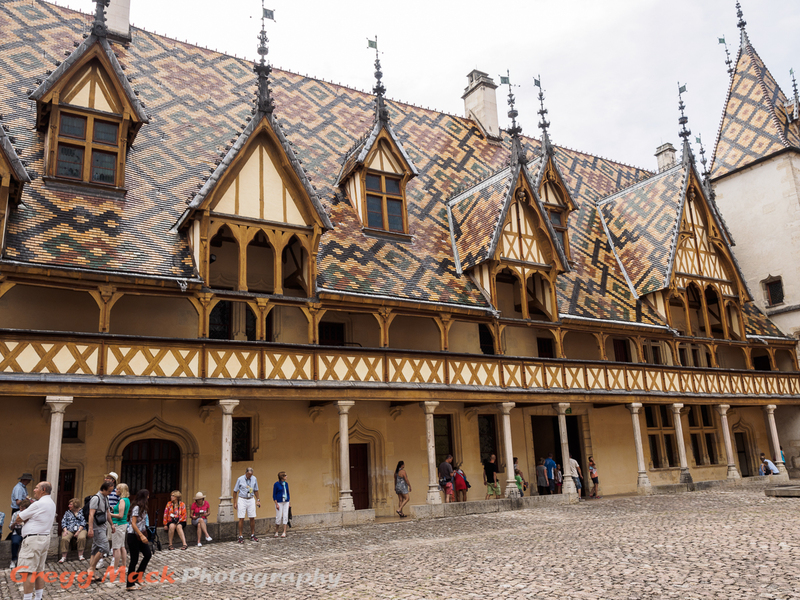 In Beaune, we toured the Hôtel-Dieu de Beaune, which was a hospital for the poor and was founded in 1443. 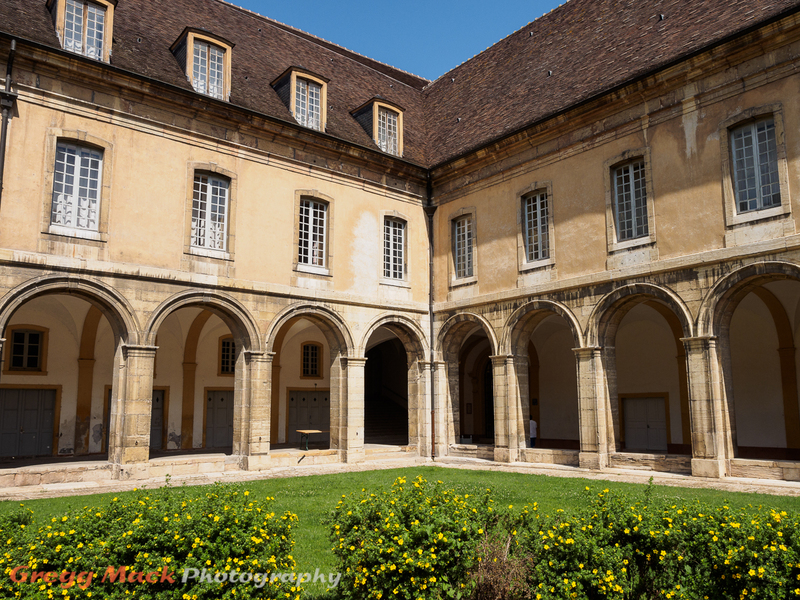 Tour of the Hotel-Dieu, which was a hospital for the poor in Beaune. 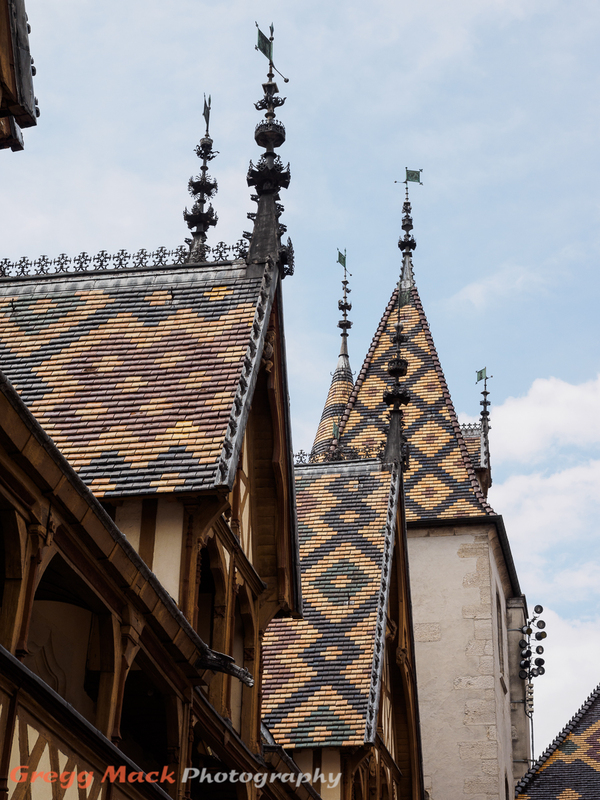 This building is one of the finest examples of French fifteenth-century architecture, and is very well known for its polychrome roof. 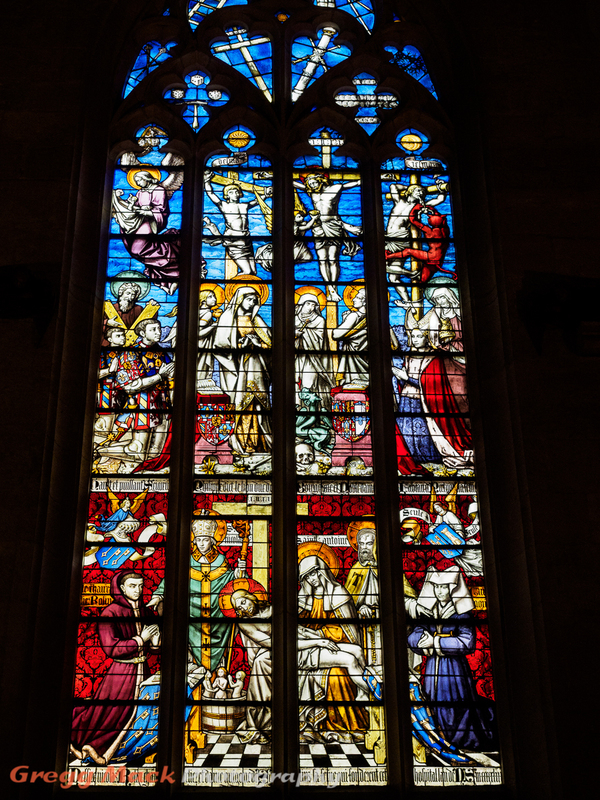 Within this fabulous building, I took this photo of one of the many stained glass windows. 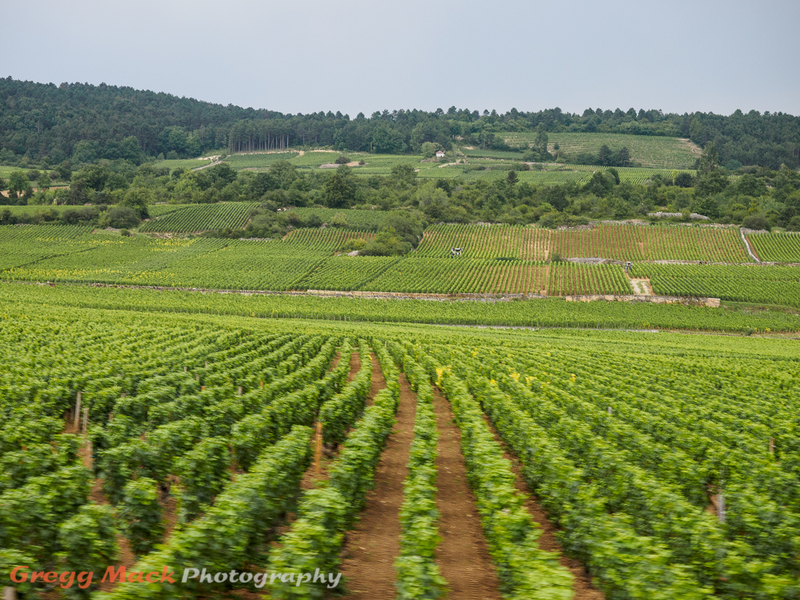 Here is a photo that I took from our moving bus, while traveling through the beautiful Burgundy wine region. Bus ride through the Burgundy wine region. 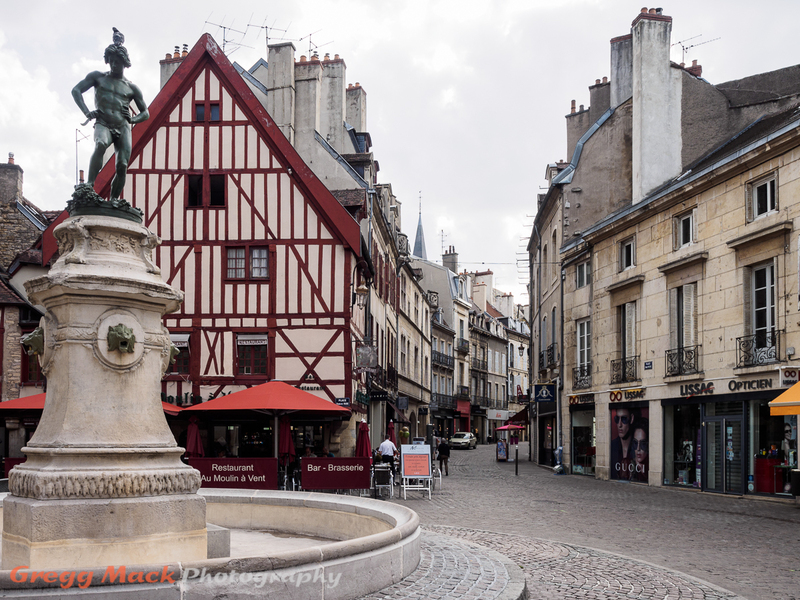 The next morning, we said goodbye to our boat, rode on a bus to Dijon, where we had only a little over one hour to walk around the historic part of this old city before we got back onto our bus and head toward the train station. 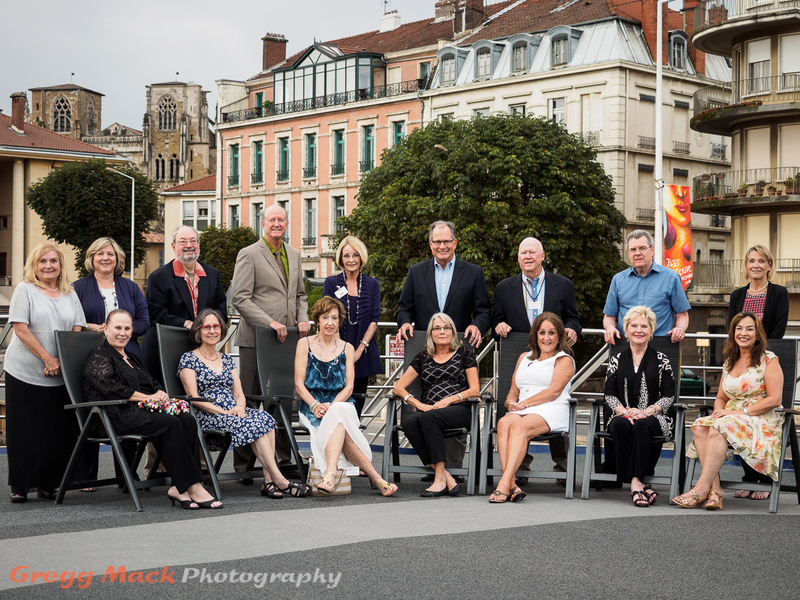 Walking tour in historic part of downtown Dijon. 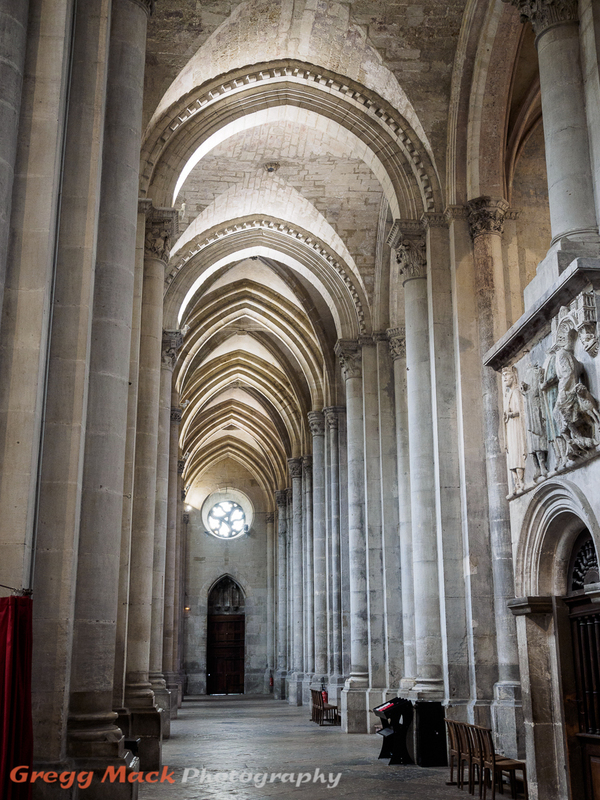 Dijon has a very long history, which includes the Romans. The part of town that we walked through was built in the late middle ages and into the 18th century. We eventually came into a large open area with fountains. 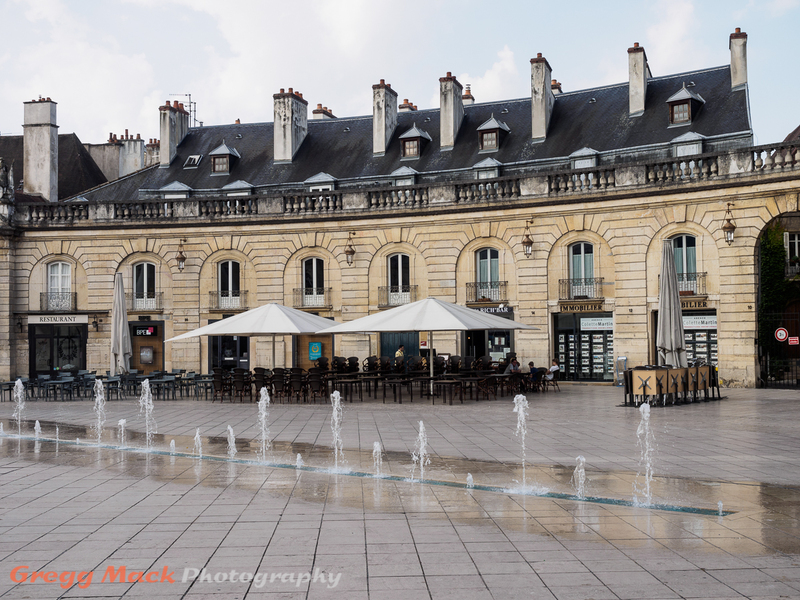 We were also directly across the street from the Dijon City Hall. It took us nearly 30 minutes to get to the high speed train station; the Train à Grande Vitesse (TGV), which would take us to Paris. At times we were moving at close to 200 mph. Somewhere in the middle of farmland, another train appeared outside of the very thick window, and I was very lucky to get this photo of it while both trains were moving at a very high rate of speed. Riding the Train à Grande Vitesse (TGV) from Dijon to Paris. It took us less than 90 minutes to get from Dijon to Paris a distance of 196 miles! Les Halles de Lyon Paul Bocuse food market in Lyon, France. 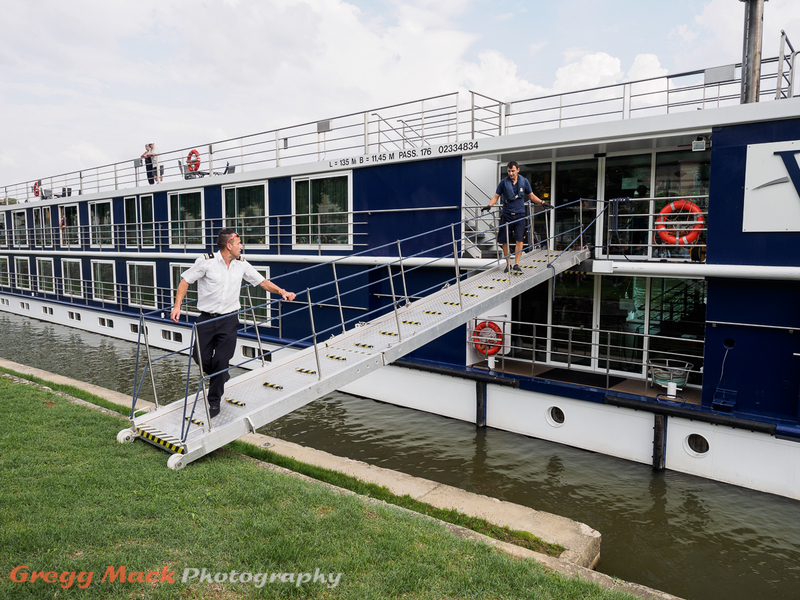 In my previous 2 posts, I have shown 34 photos from the first 5 days on the French Waterways vacation that we went on last July. This post will show 14 more photos that were taken over the next 2 days. 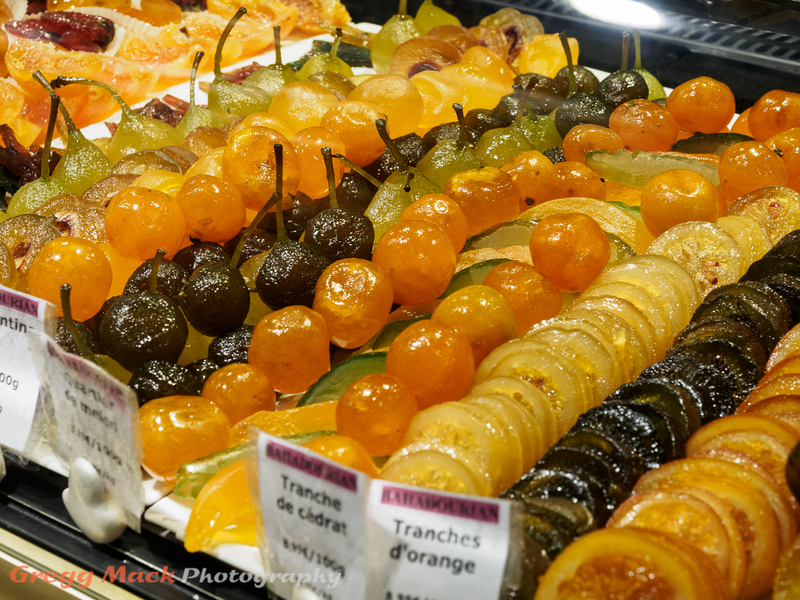 The opening photo was taken at Les Halles de Lyon Paul Bocuse food market in Lyon. 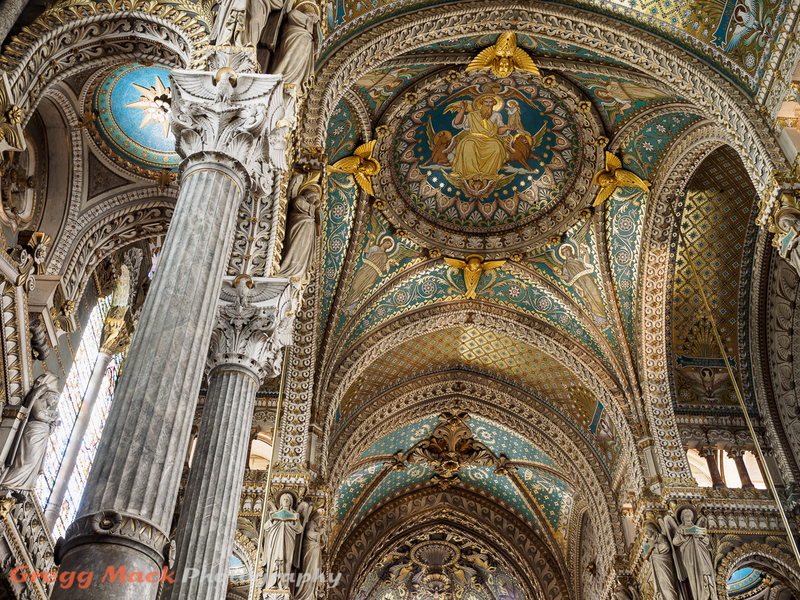 The previous photo and the next photo were both taken hand-held inside of the Basilica of Notre-Dame de Fourvière in Lyon. 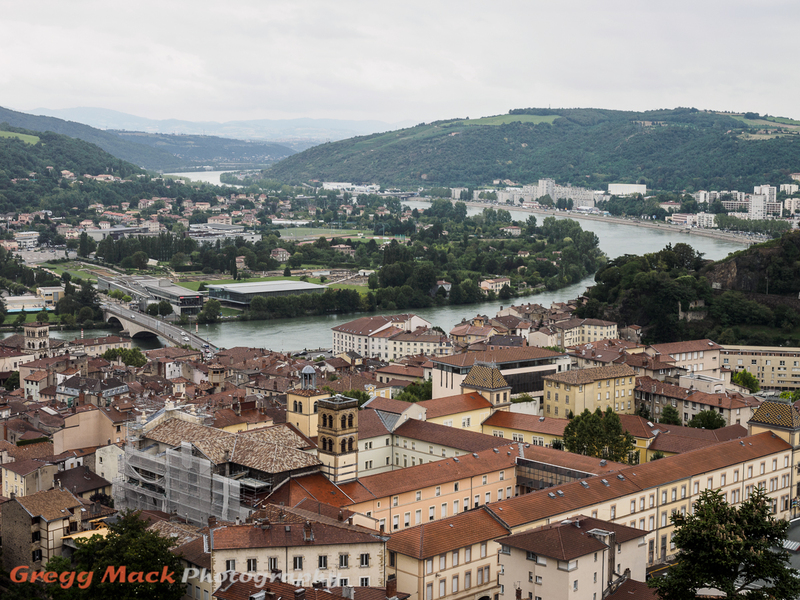 Lyon was a beautiful metropolitan area with more than 2 million people. 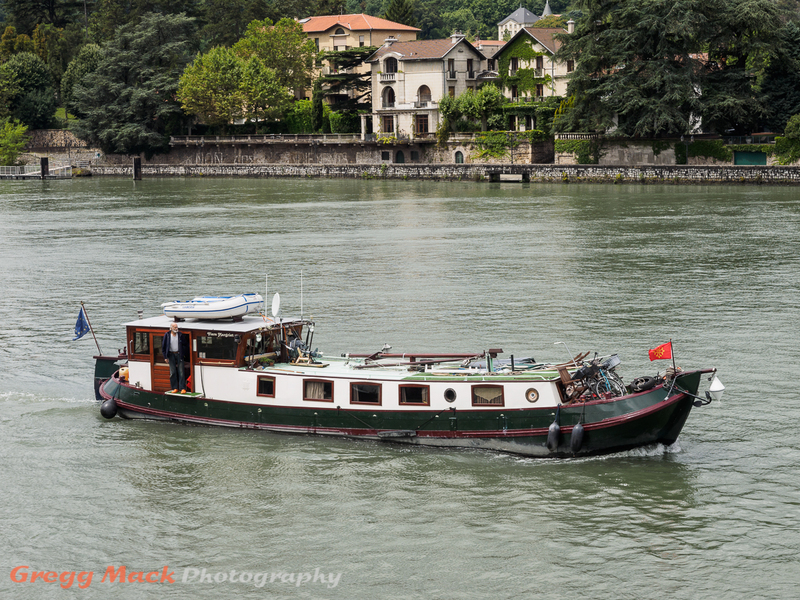 We spent the night with our boat docked on the Rhône River in Lyon. The next day, we were supposed to go out on our excursions and return to the boat just before supper, we would then begin cruising up The Saône River also flows into Lyon. Recent heavy rains upstream changed our plans, though. The Saône was rising fast, and our boat would very soon not have enough clearance to make it under some of the bridges over that river in Lyon. Instead, when we left the boat to head out onto our day-long excursions, our boat would immediately leave and try to make it past those low bridges on the Saône, and we would meet our boat somewhere north of Lyon. In the afternoon, we visited the Medieval town of Pérouges. 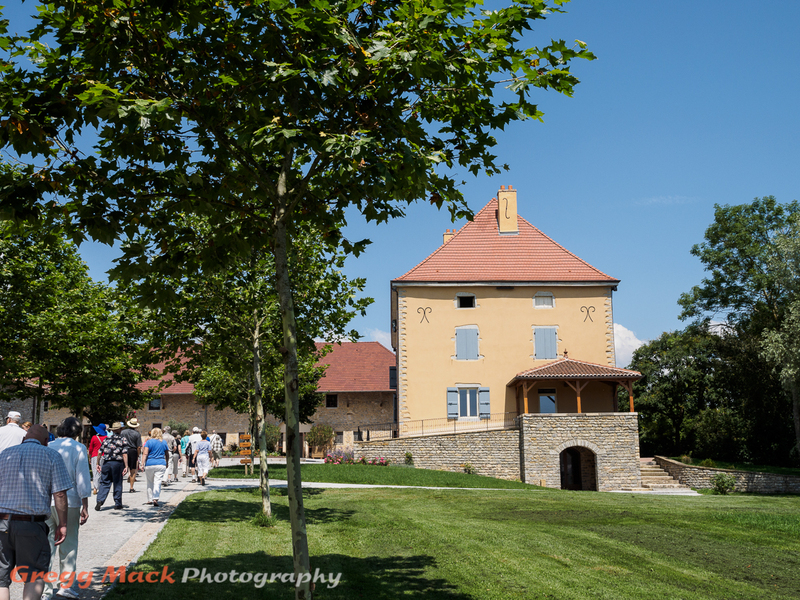 Tour of the Medieval town of Pérouges. I don’t think the hanging ears of corn are anything more than mere decorations. 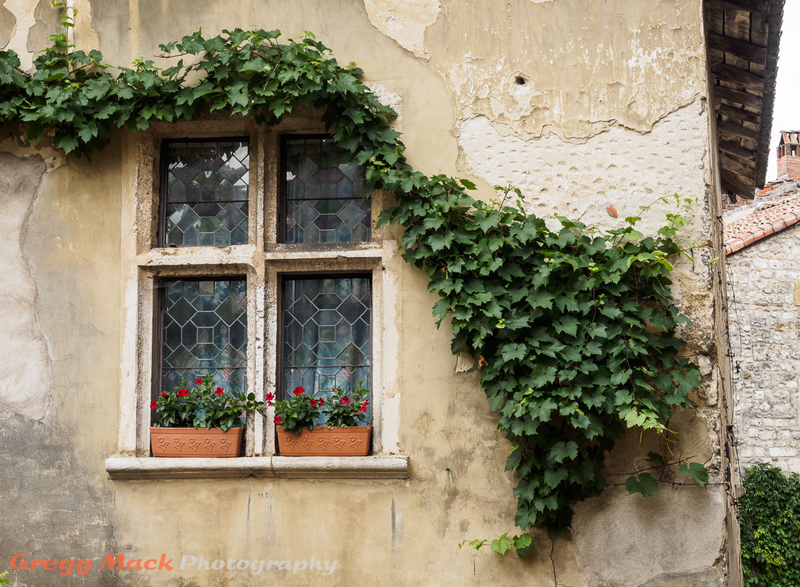 This ivy didn’t seem to crawl up the wall, it seemed to be rooted in the wall. 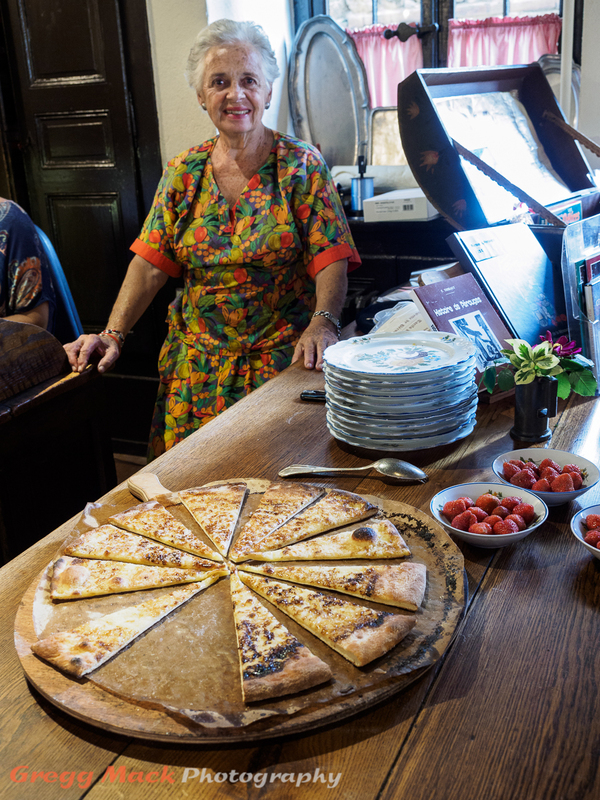 Friendly server of gallette in Pérouges. View from the bus on the ride to meet our boat on The Saone River. 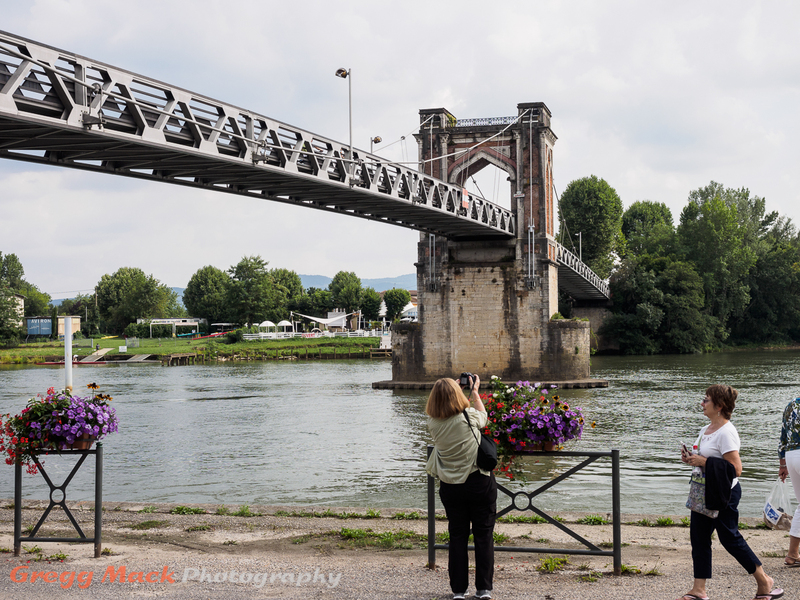 After leaving the Medieval town of Pérouges, we jumped onto our busses and headed west to see if we could find our boat on the Saône River. These 3 photos were taken out of a bus window. The bus was moving a highway speeds. 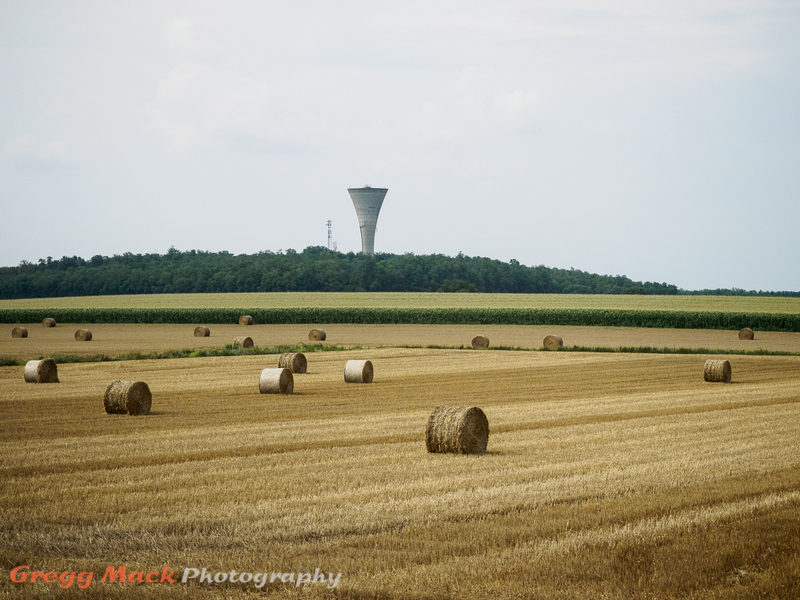 I jacked up the ISO, opened the aperture all the way, used a very fast shutter, and took LOTS of photos of the beautiful French farmland. I must have taken 90 – 100 photos during that hour long bus ride. I kept about 10 of them. Just as our bus arrived in Trévoux, our fabulous boat came cruising up the Saône! We got off of the bus, and had a few minutes to spend while the crew docked our boat. Bridge over the The Saone River. I wandered over to watch the crew dock our boat and prepare the gangplank. Boarding our boat on The Saone River. 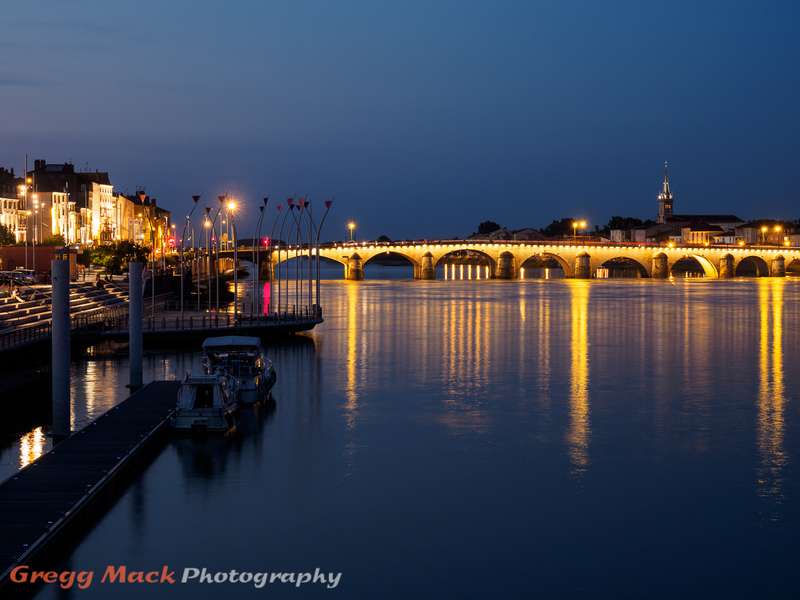 After dinner, a little after 9:00 PM, I went up to the top of the boat to have my first look at the Saône River. 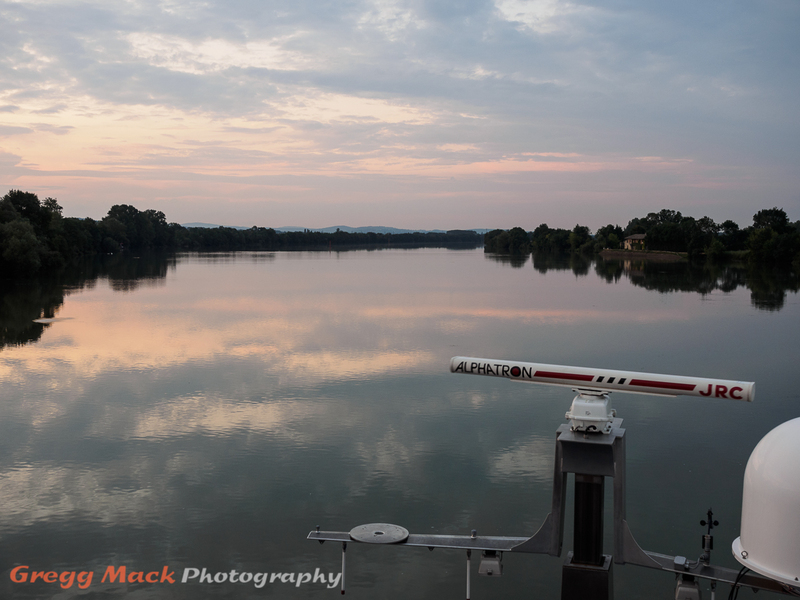 Cruising north of Lyon on The Saone River at twilight. Thank you for visiting my (infrequent) blog. 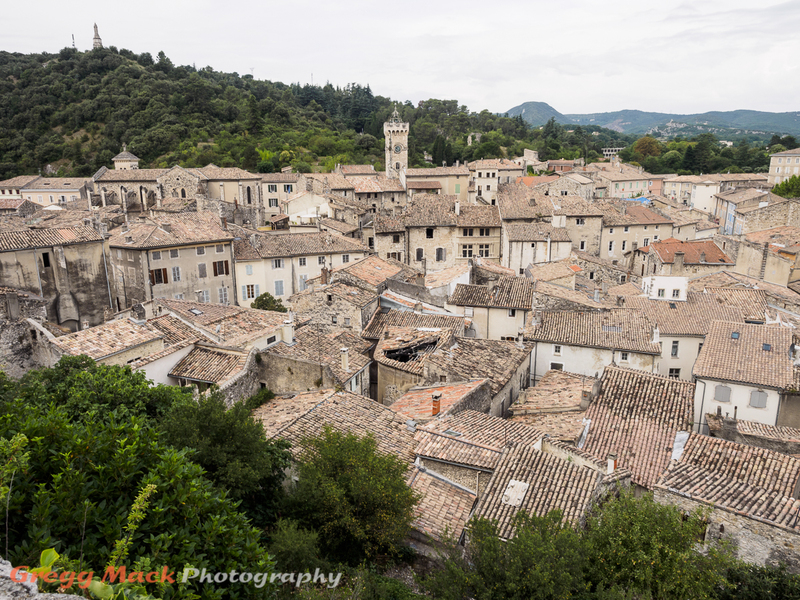 Walking tour of the Medieval town of Viviers. 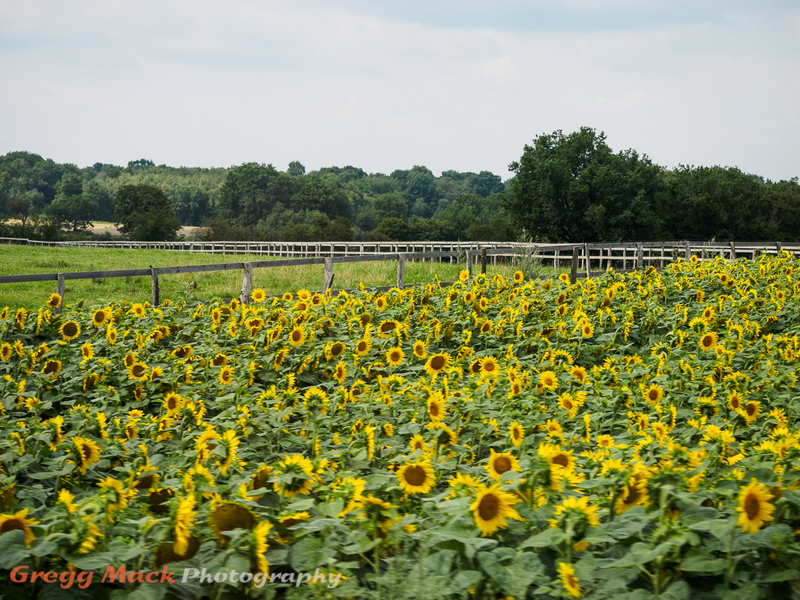 In my previous post, I shared 19 photos of our first 3 days on the French Waterways vacation that we went on last July. 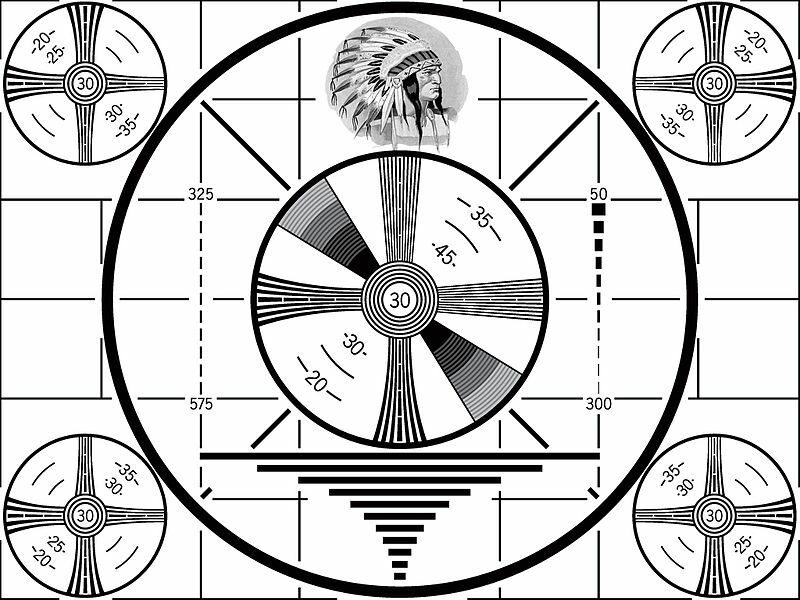 This post will show 15 more photos that were taken over the next 2 days. 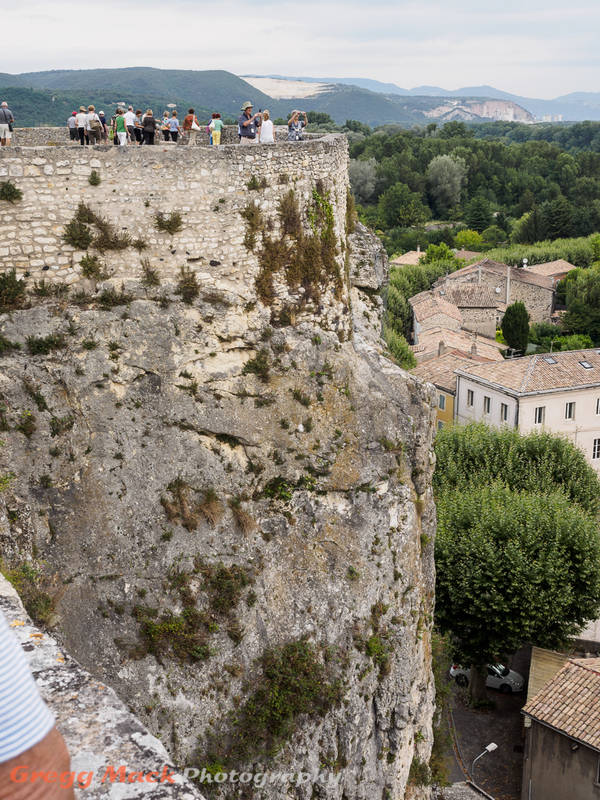 The opening photo and the next two were all taken after we hiked up from the Rhone River to the small walled city of Viviers. 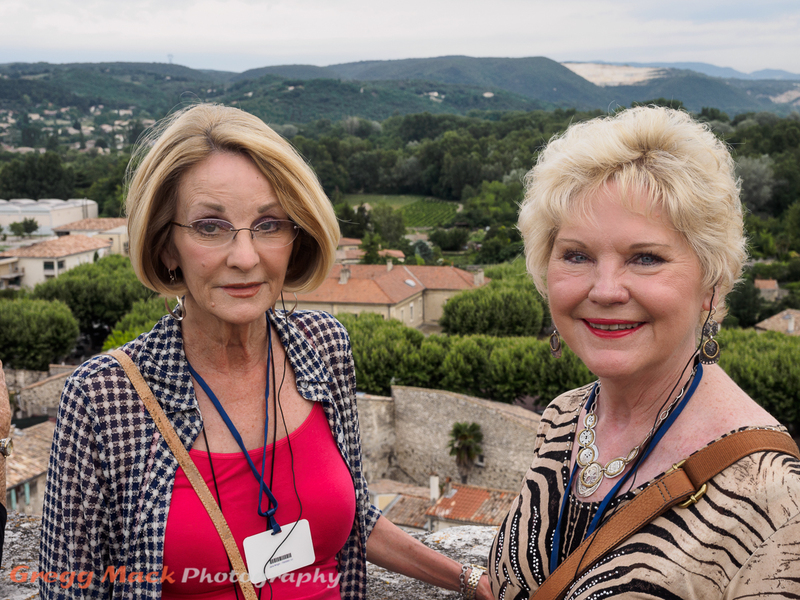 Jana and Barb at scenic overlook in Viviers. 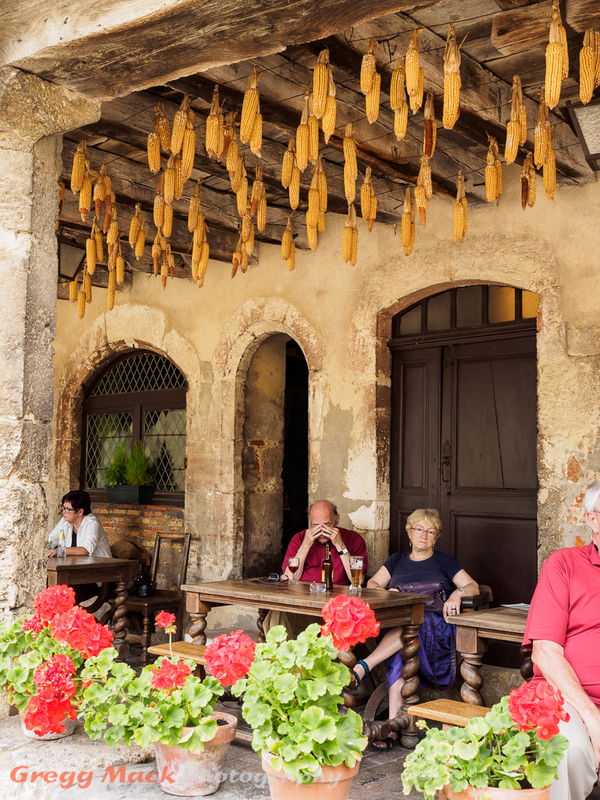 This small town was built during the Medieval Ages. There were only one or two streets that a car could travel short distances on. Chandellier inside Medieval church in Viviers. 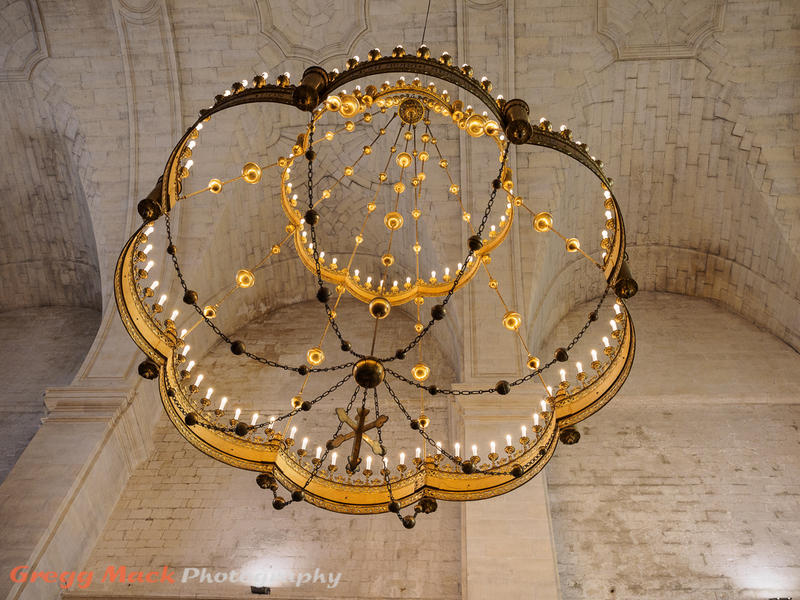 The chandelier above was in the Viviers Cathedral, which construction was started on in the 11th century. 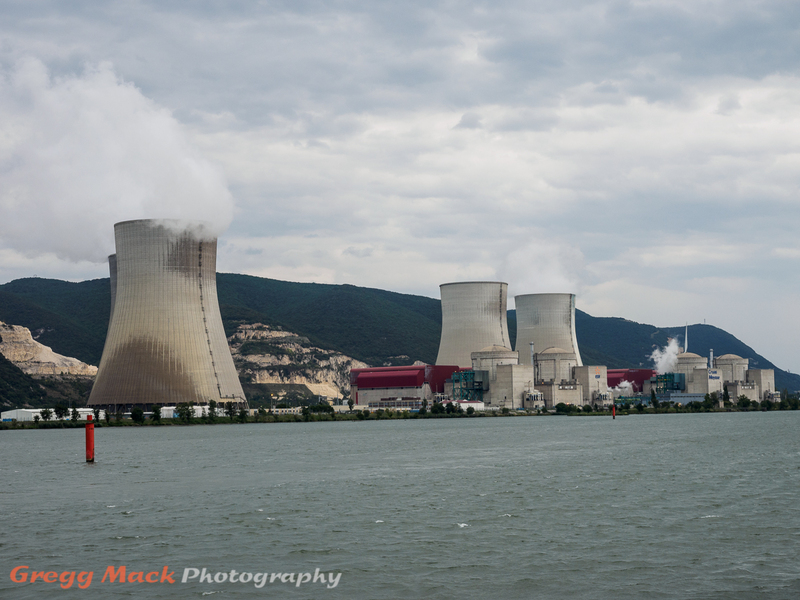 Nuclear power plants on the Rhone River, north of Viviers. 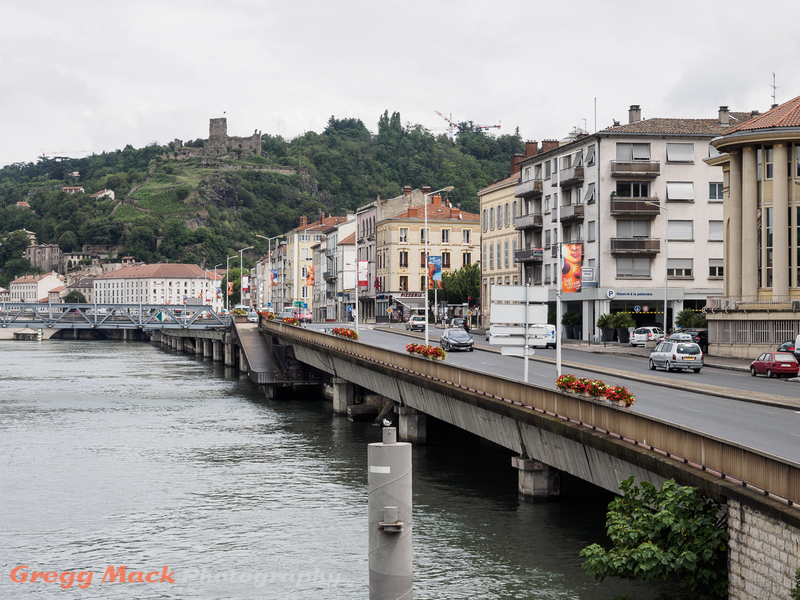 That afternoon, it drizzled and rained on us as we cruised further north up the Rhone River. About noon the next day we arrived in the city of Vienne. From our docked river boat in Vienne. While we were waiting to waiting to disembark on our walking tour of Vienne, I went up to the top of our boat. While I was there, this French gentleman cruised past us in his houseboat. A houseboat passes by our docked river boat in Vienne. A Medieval house on the left, next to some Roman ruins in Vienne. The house with the criss-cross timbers was built in the Medieval Ages, and they built it right next to the arched wall that the Romans had built! We hiked up to the Chapelle Notre Dame de la Salette in the drizzle and light rain. It was worth the effort, as we were rewarded with this spectacular view of the Rhone River winding into town from the north. 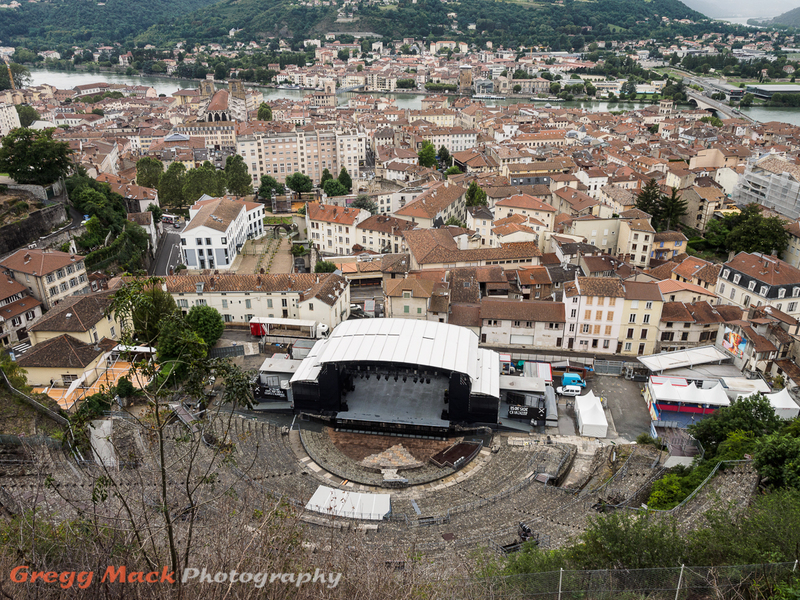 Scenic view from above Vienne, France. While standing in the same place, but looking straight down, we had a great view of what remains of an ancient Roman amphitheater. 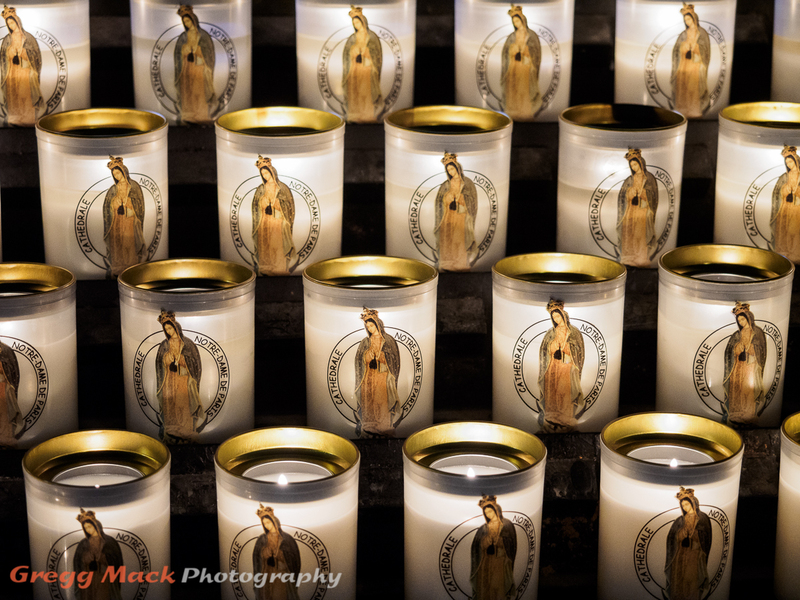 Since we had hiked up the hill to the Chapelle Notre Dame de la Salette, we went inside to get out of the rain. Chapelle Notre Dame de la Salette, a medieval church above Vienne, France. 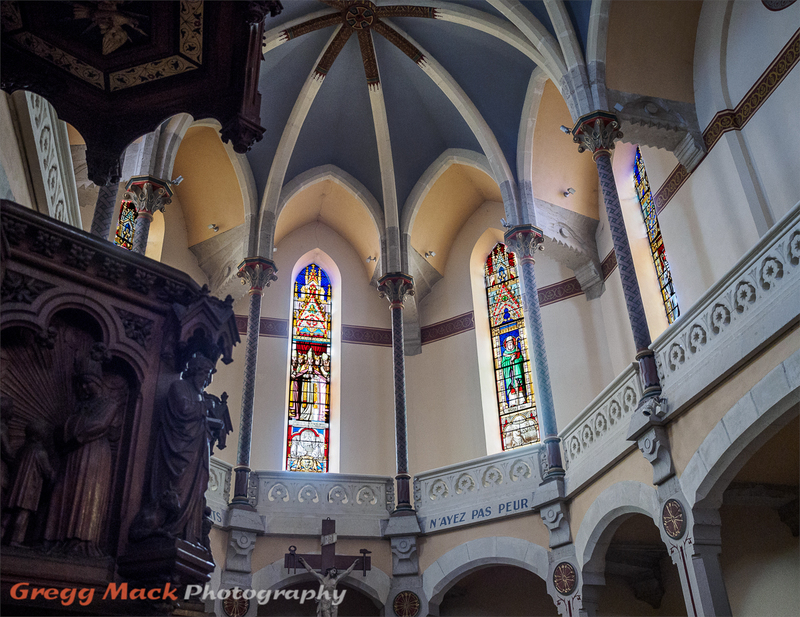 If that looks somewhat odd, it is because it is a composite of two different exposures: one for the inside of the church, and one for the stained glass windows. 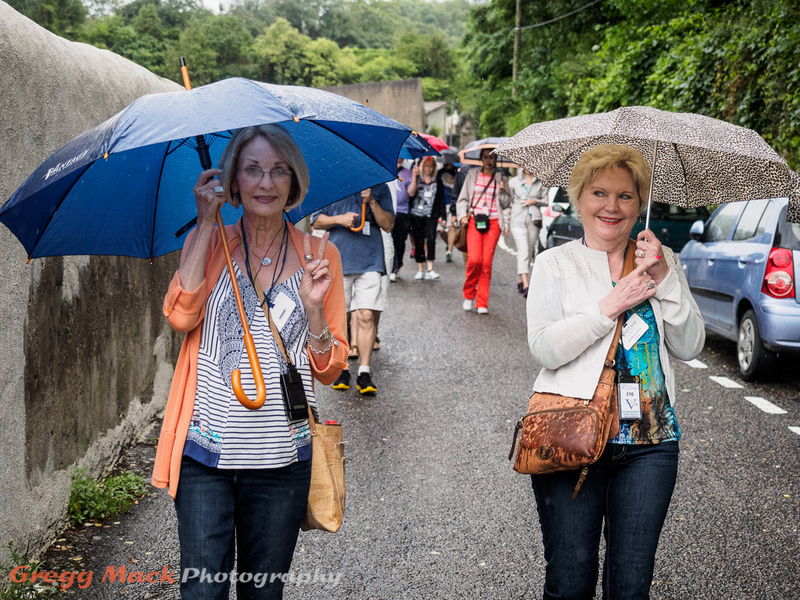 Jana and Barb on the walking tour of Vienne, France. It was a good thing that my camera and lens are pretty much weatherproof, as I didn’t have an umbrella like Jana and Barb did. 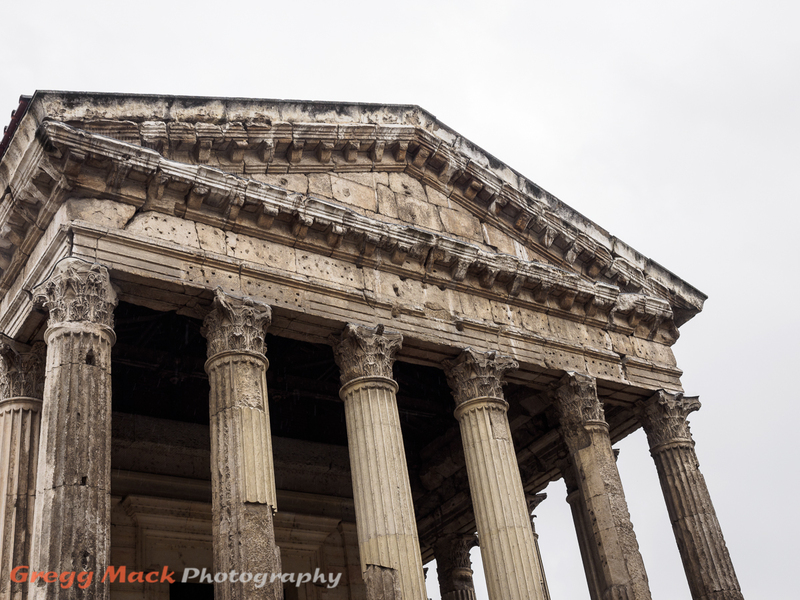 When we got back down to the city, we got to see a still-standing Roman temple; the early Imperial temple of Augustus. 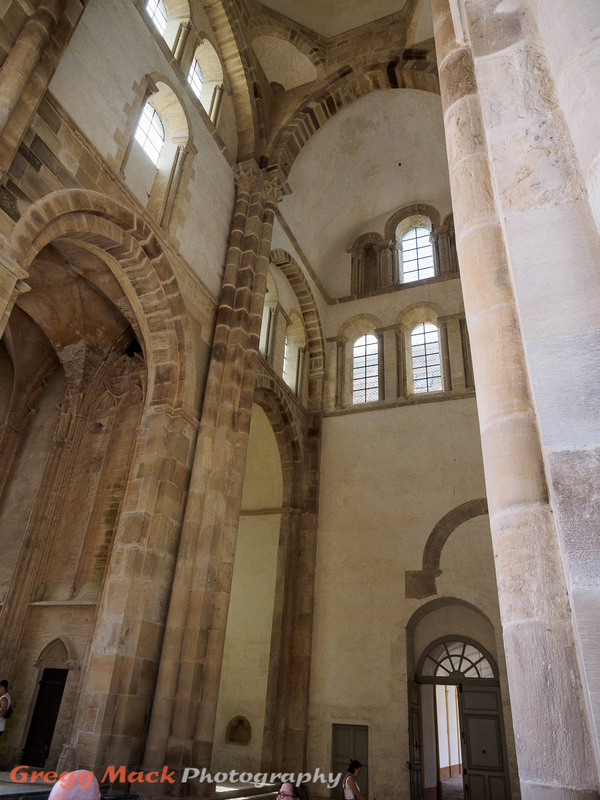 We also went inside of the Cathedral of St. Maurice, which was built over a long period of time; between 1052 and 1533. 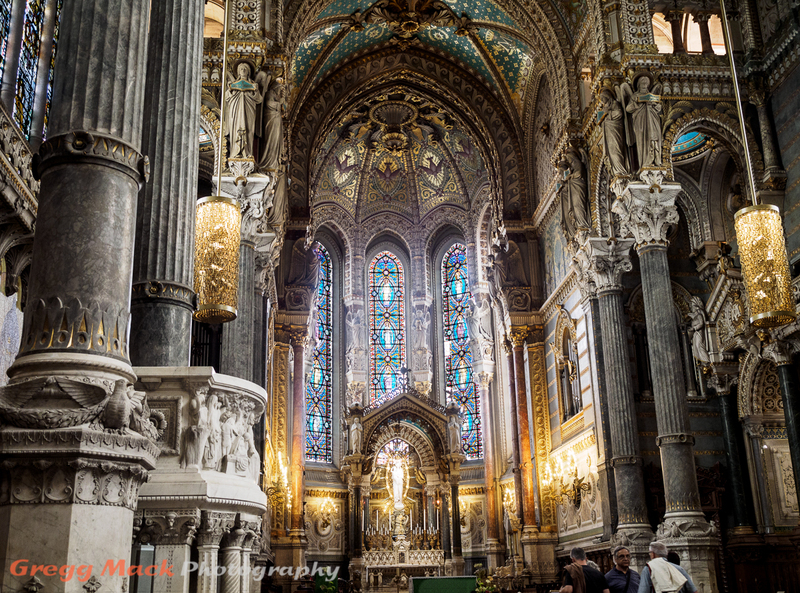 I should mention that I only took one camera to France; an Olympus OM-D E-M1. Although I did take 5 lenses with me, I only used two of them, and ALL of the photos that I will share in this 5 Part series were taken with one single lens; the Olympus 12-40mm f/2.8 PRO. In addition, every photo that I have shared up to this point was taken while hand-holding the camera. This next photo is different, as I used my travel tripod and the self-timer on the camera. This photo of our entire group was taken at 9:20 PM, and since it was getting dark pretty fast, I bumped up the ISO to 400, but even with the aperture wide-open at f/2.8, the shutter was open 1/20th of a second. 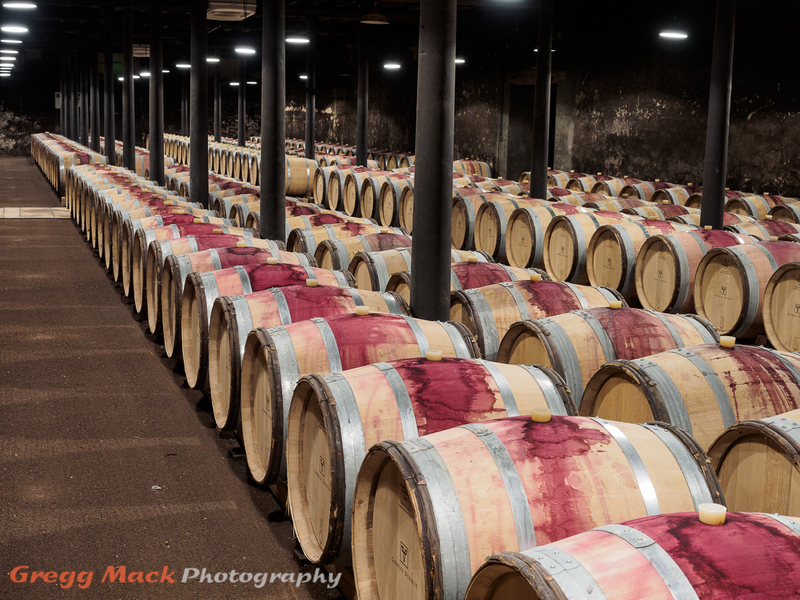 After all of the wine that we had consumed at dinner, it’s amazing that nobody wobbled into a blurred state…. Helpful Hint: You can always view any photo at a larger size by just clicking on it. You will then need to use your browser's "Back Button" to return to Gregg's story.